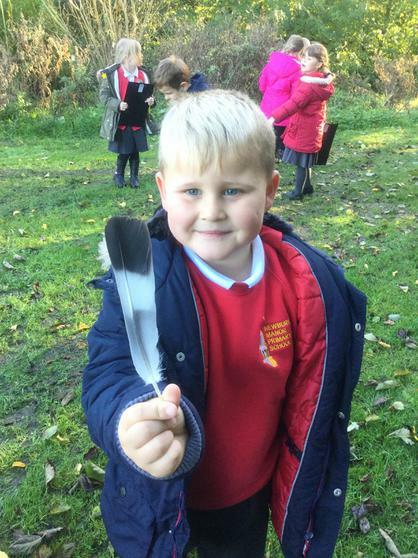 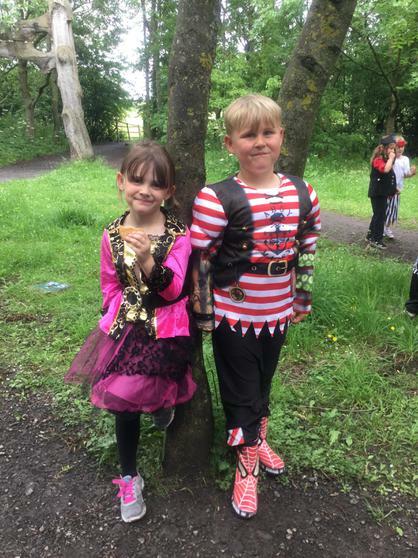 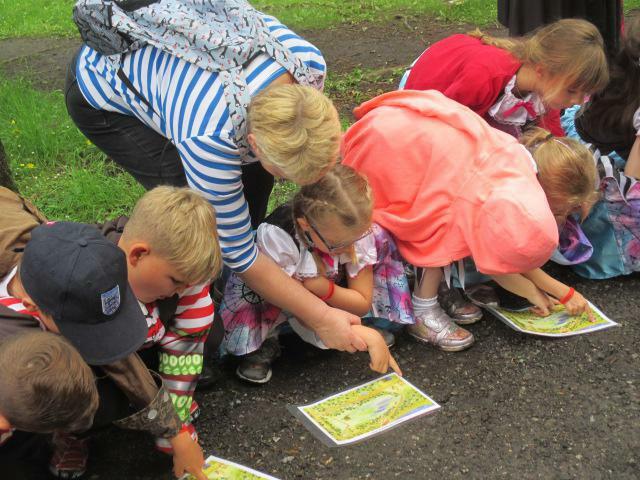 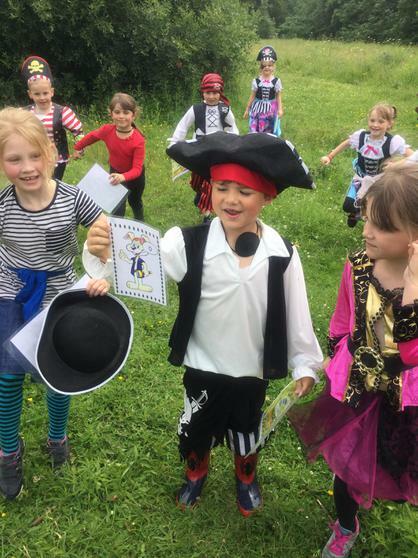 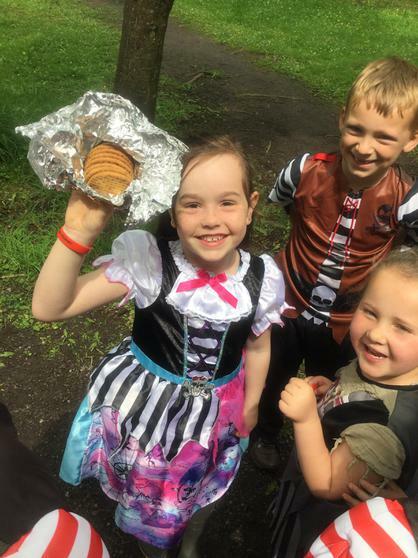 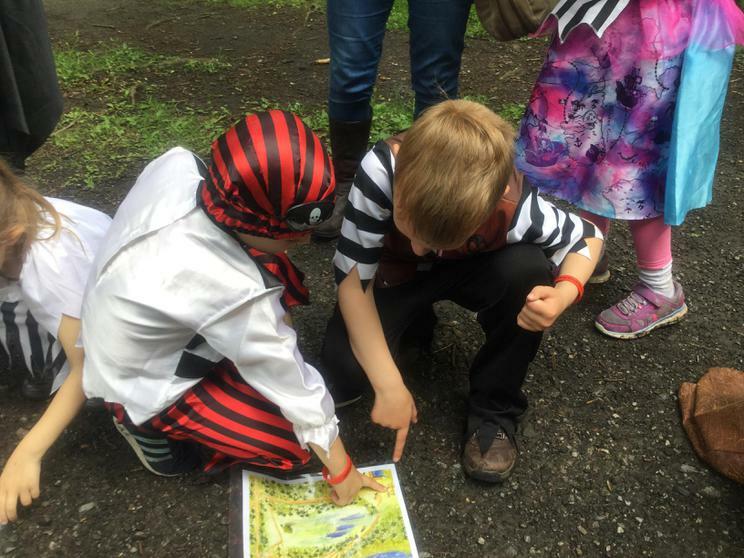 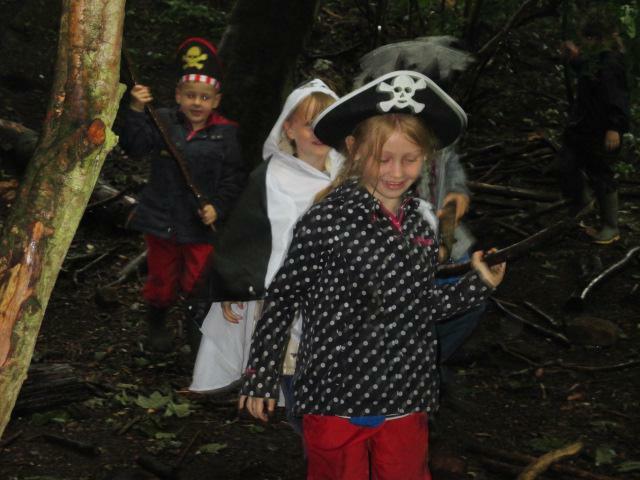 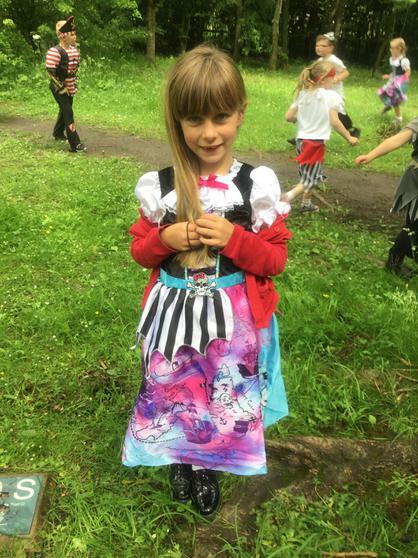 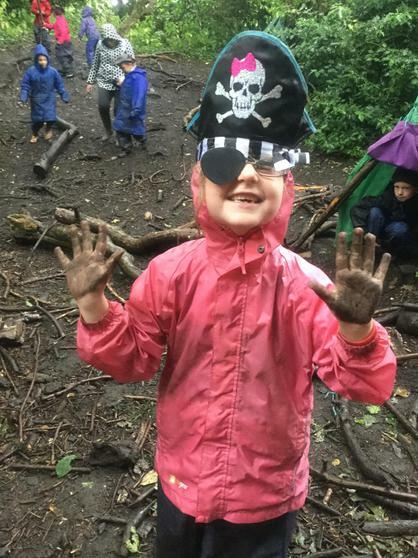 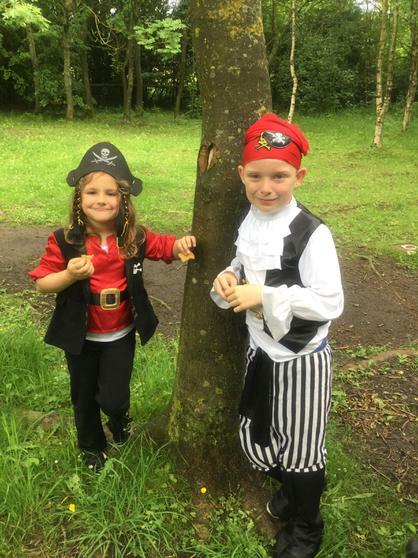 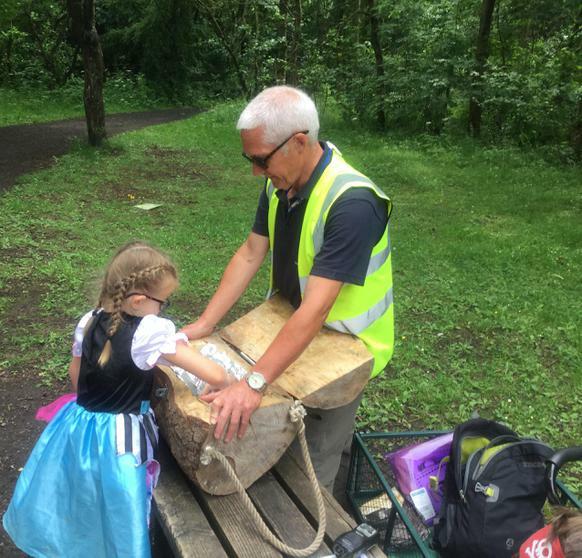 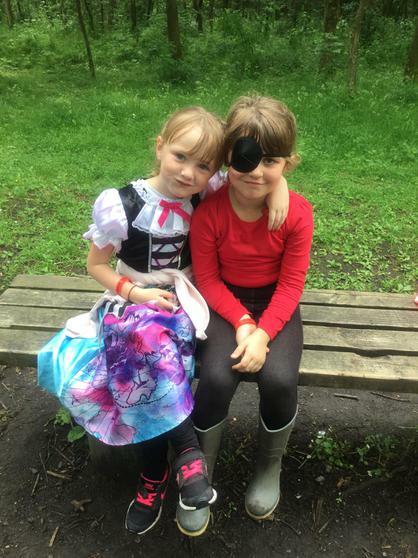 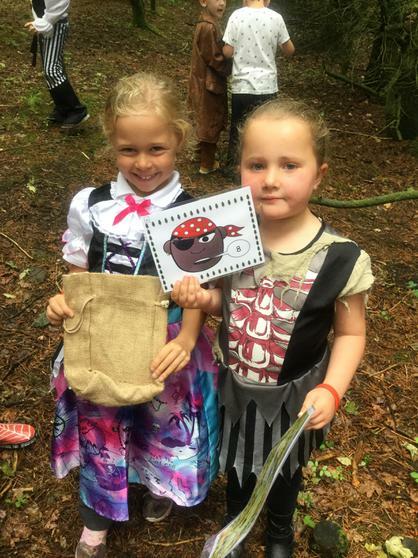 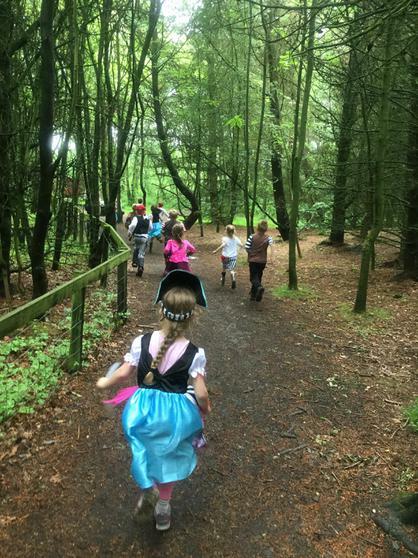 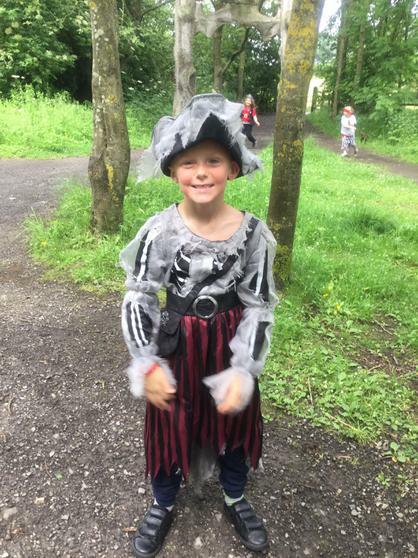 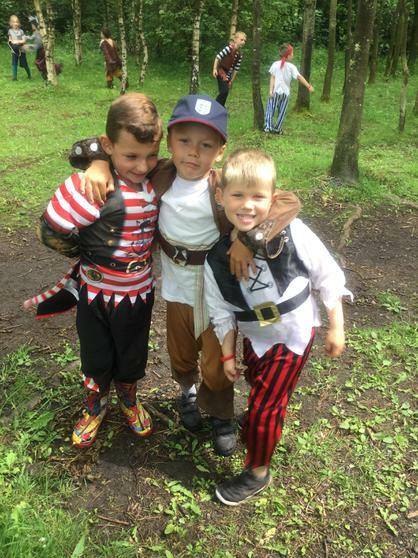 We had an amazing time at 'Pirate School' at the Rising Sun Country Park! 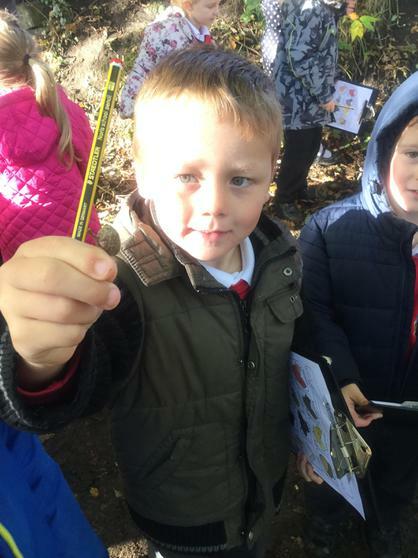 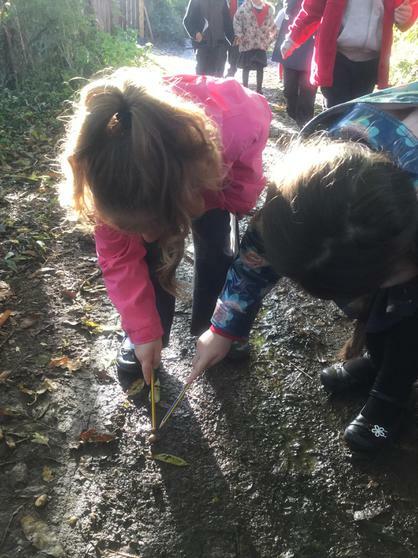 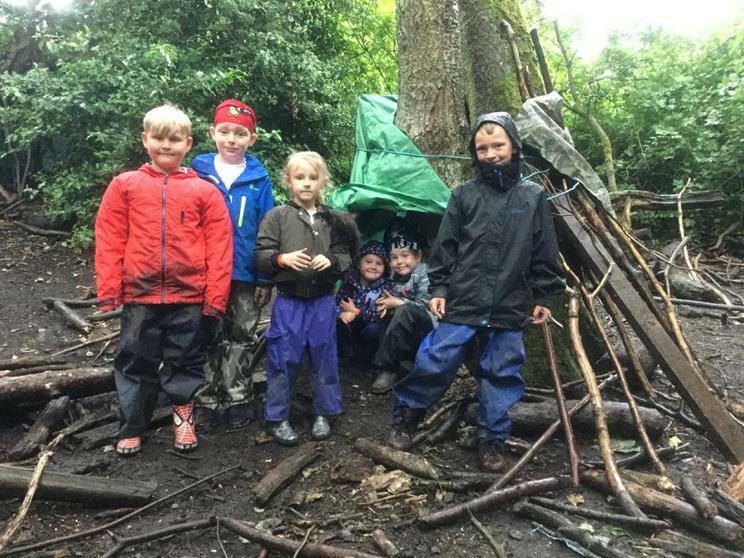 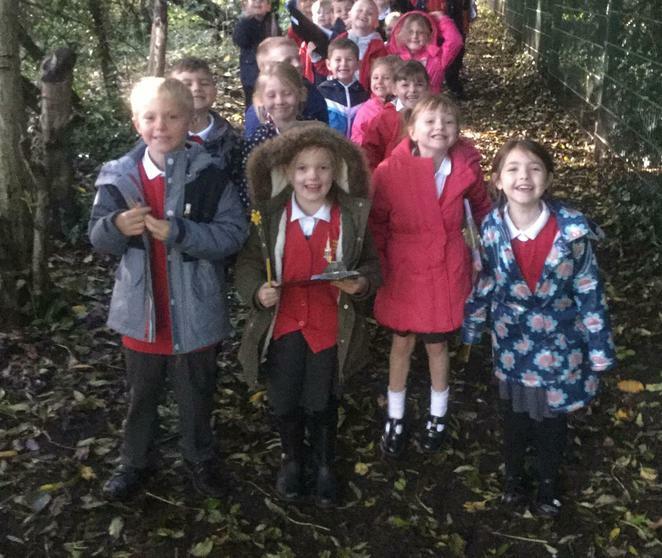 We learned how to make dens from sticks, twigs, rope, pegs and tarpaulin and we used treasure maps to follow a trail through the fields. 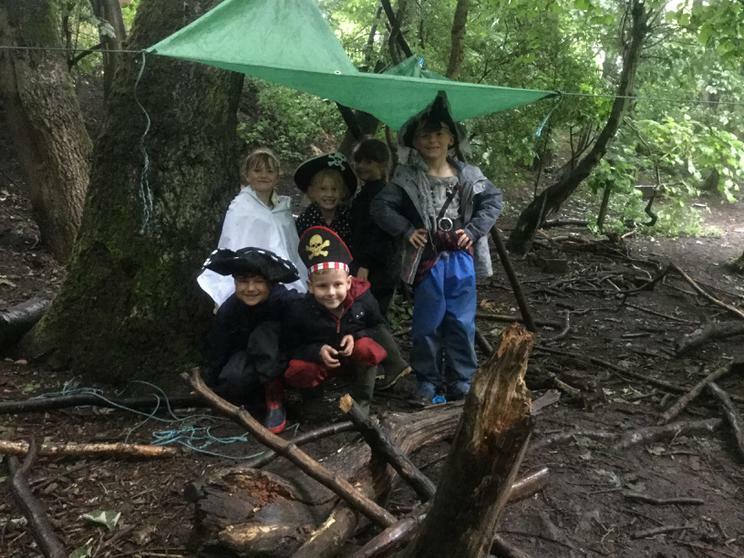 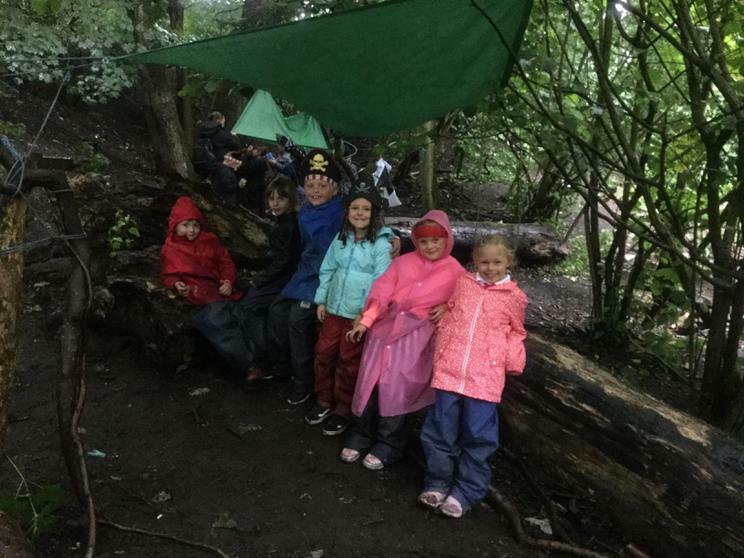 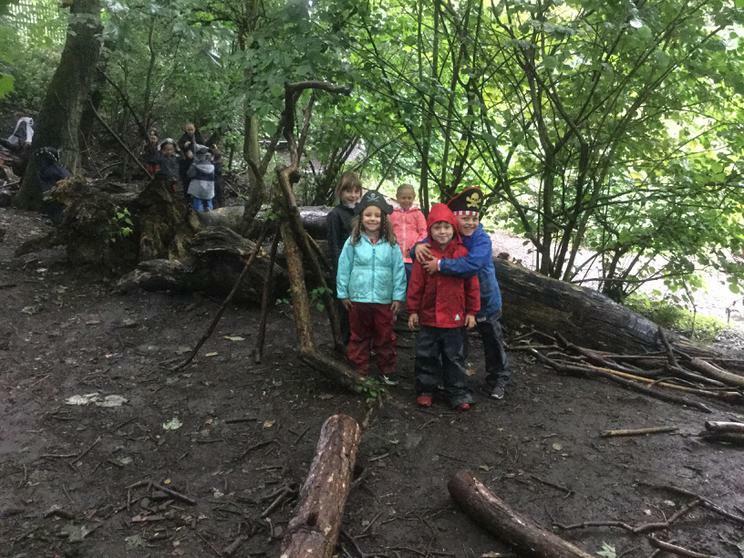 We got soaked in the rain while making our dens in the morning but we didn't really mind. 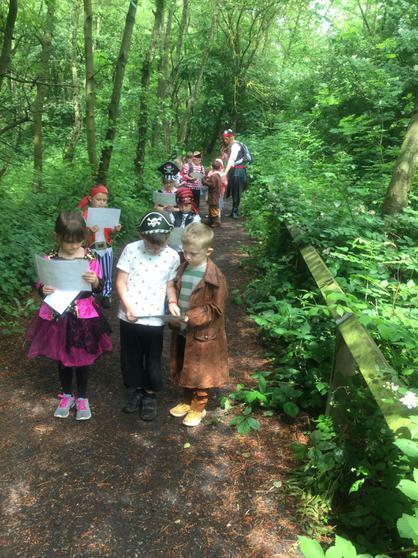 Luckily, it was really warm and sunny in the afternoon while we ran through the open woodland to find the clues for the treasure chest. 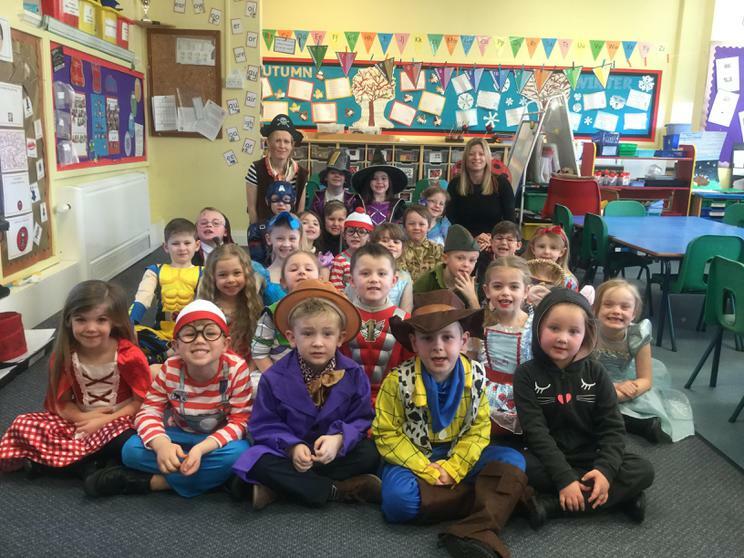 What a fun-packed day we all had! 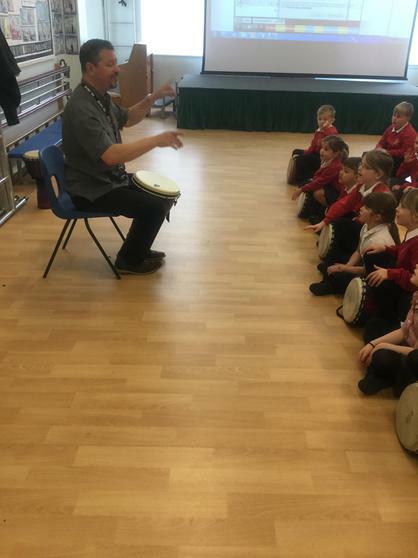 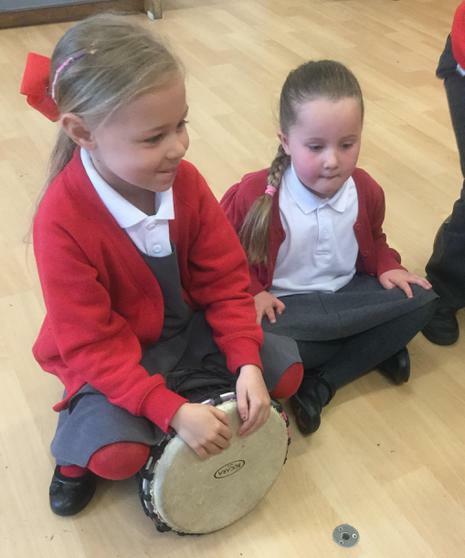 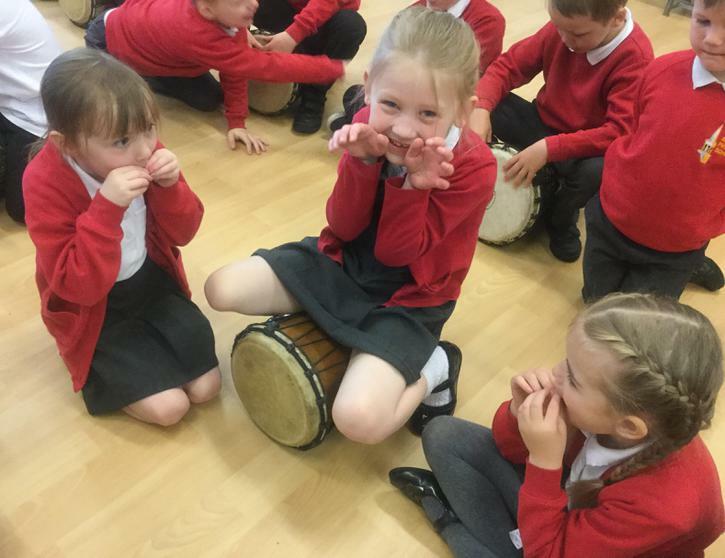 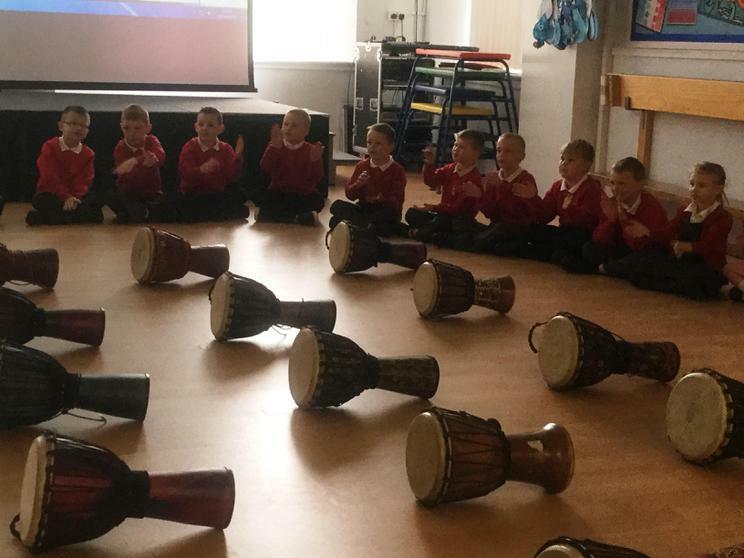 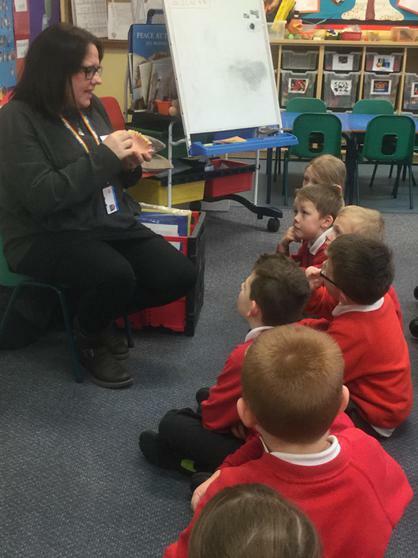 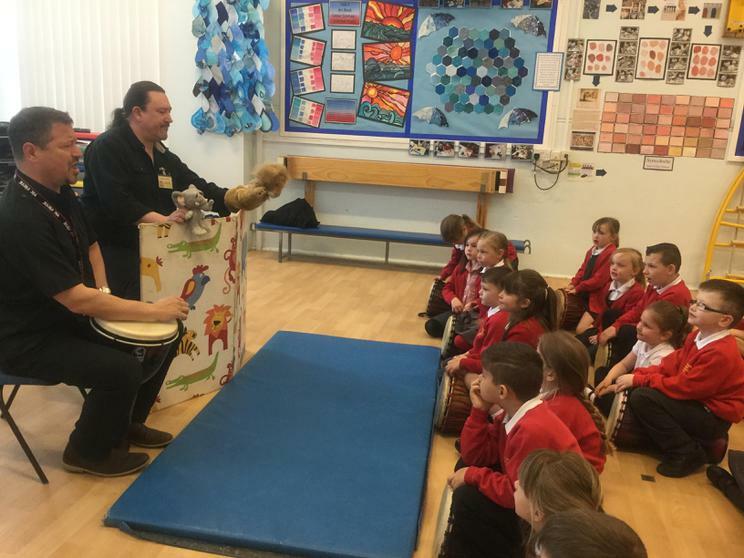 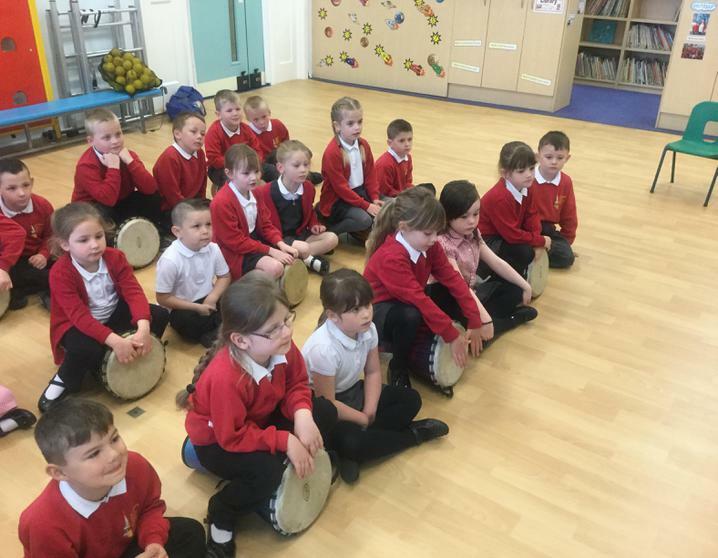 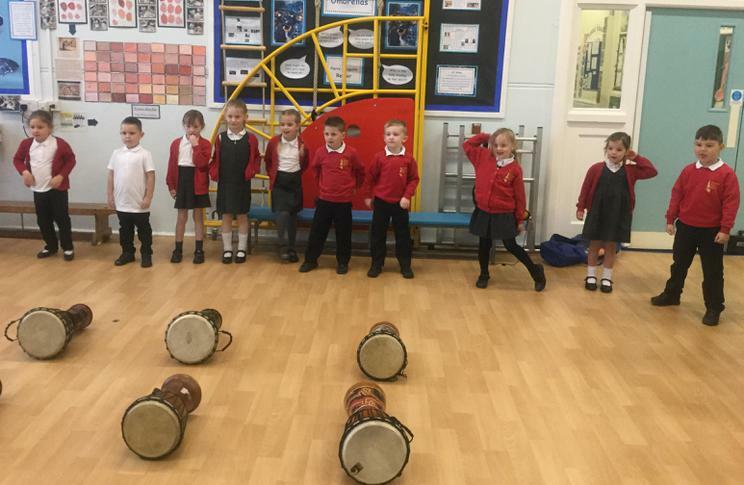 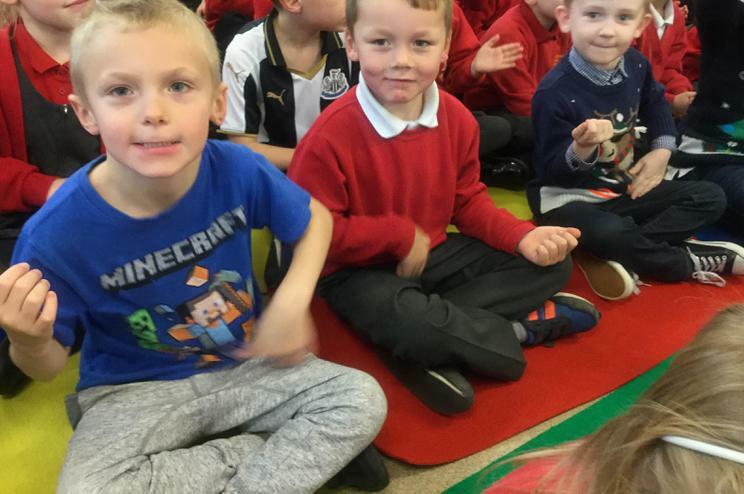 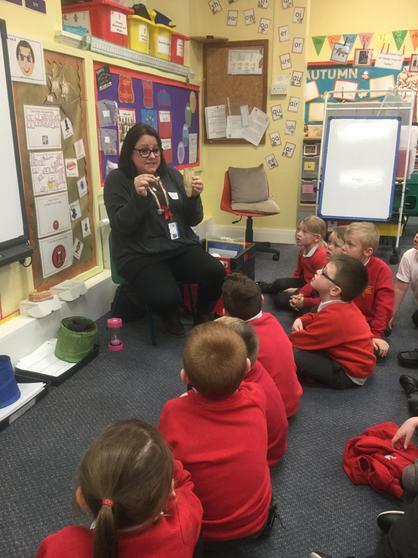 We have been enjoying learning how to play the djembe with Franco and Steve from Newcastle Music Service and have been using different animal names to produce various sounds on the drums. 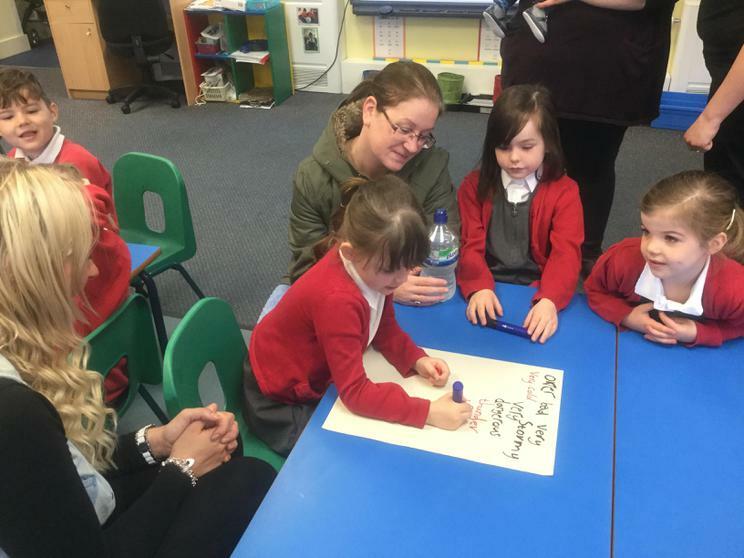 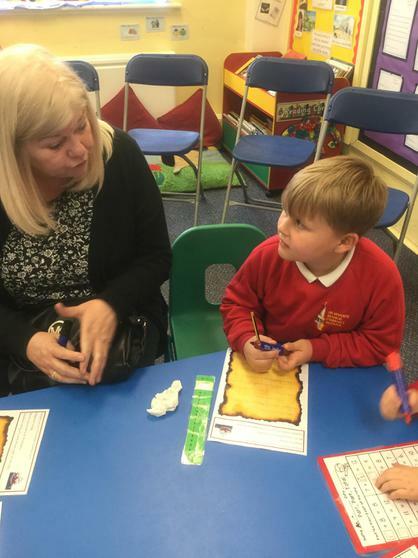 We would like to thank the parents and carers who managed to visit school today for our 'Come and See' morning. 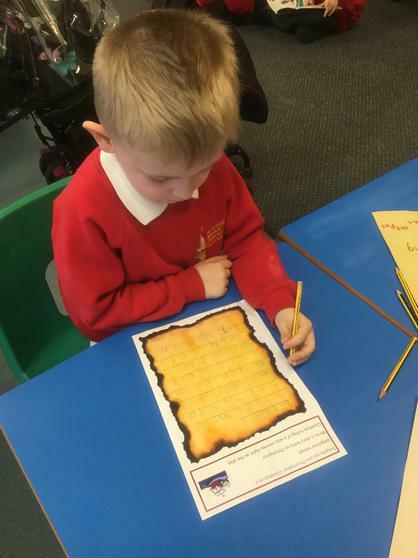 We had a lovely time 'meeting' Christopher Columbus and finding out more about one of his dangerous voyages! 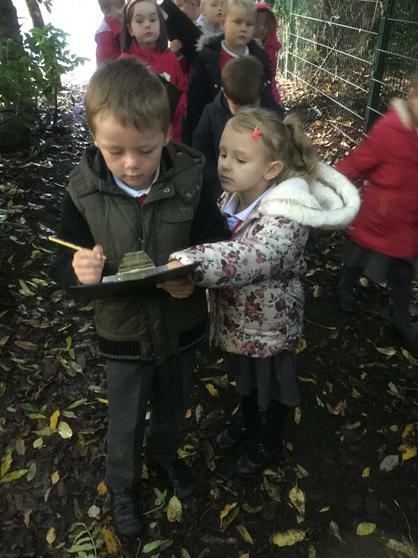 We enjoyed pretending to be our famous explorer while writing a fictional diary entry. 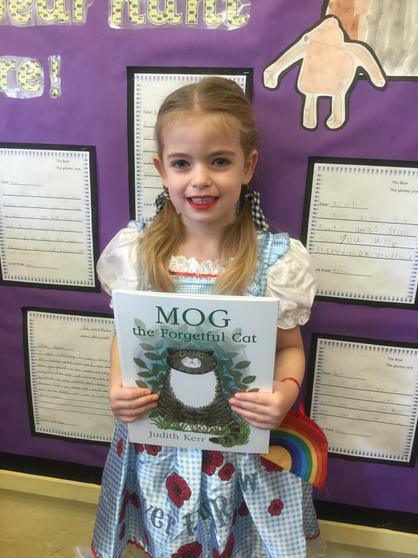 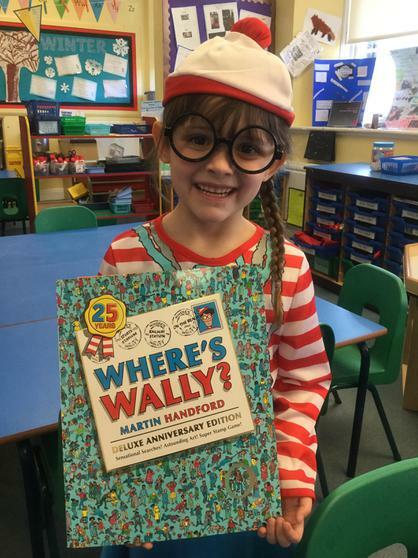 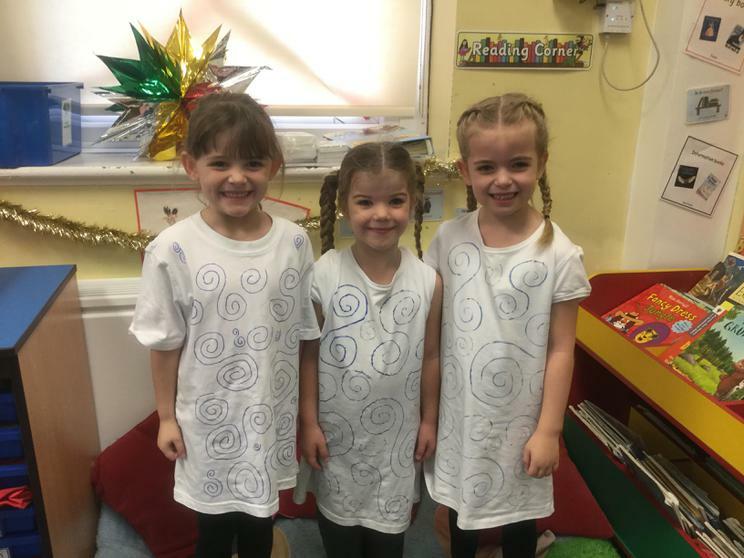 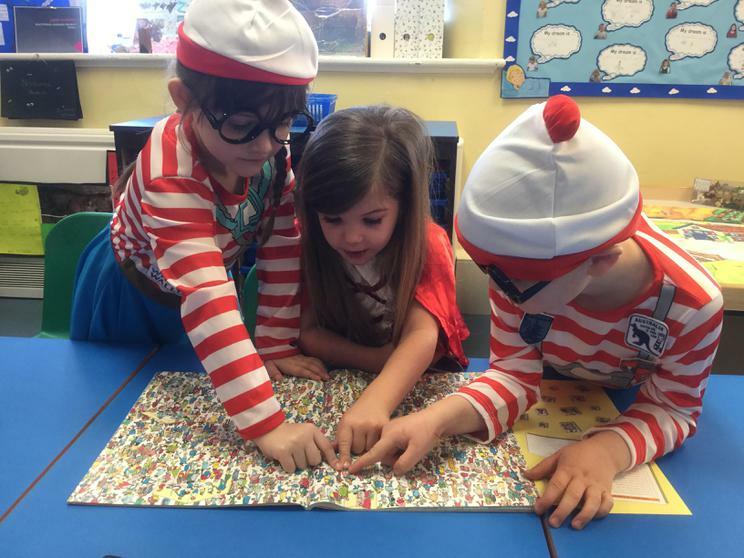 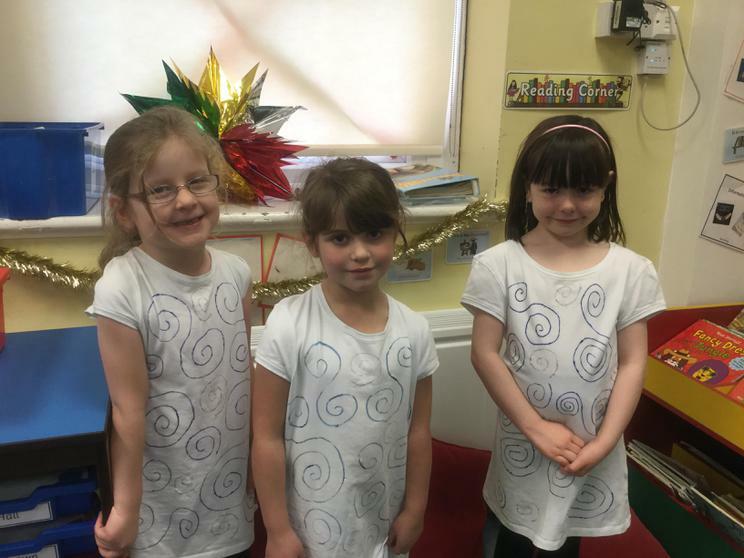 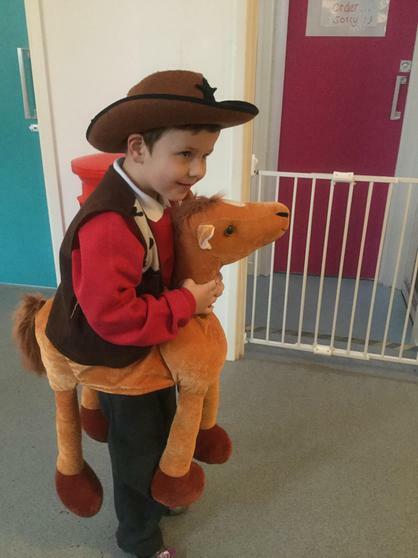 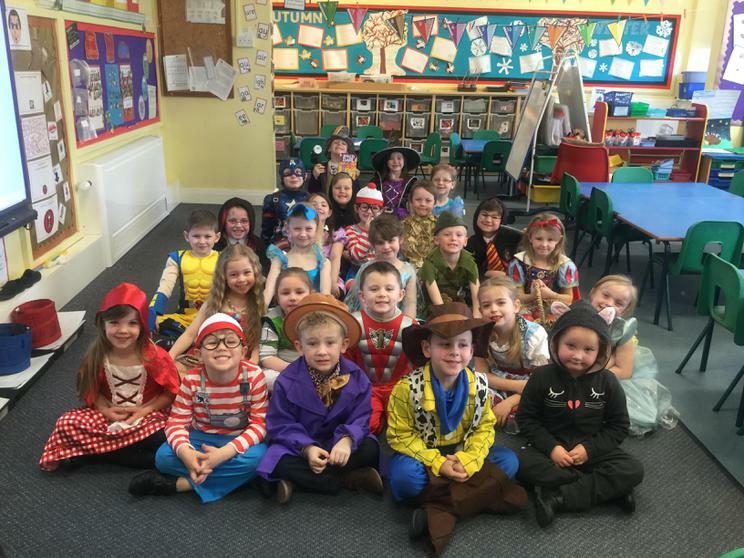 What a fun-packed day we have all had for World Book Day. 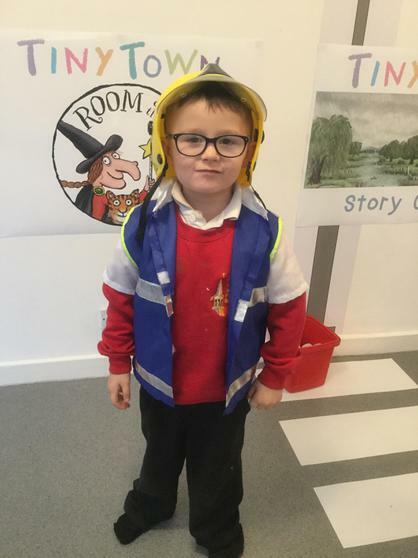 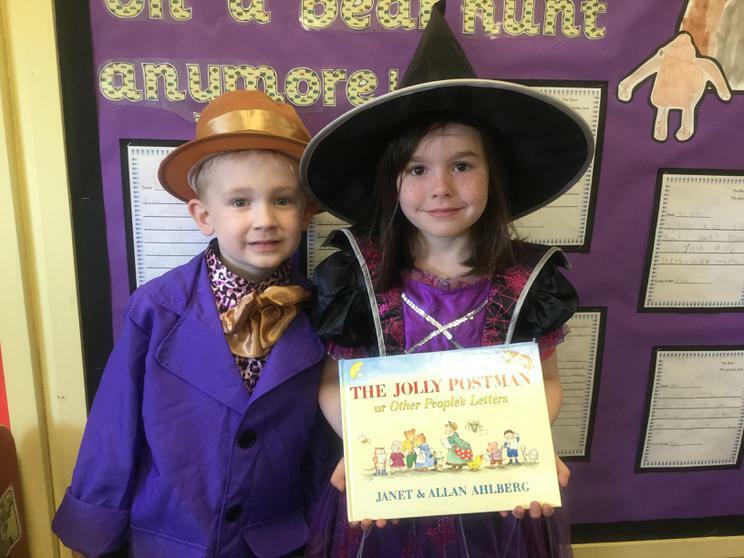 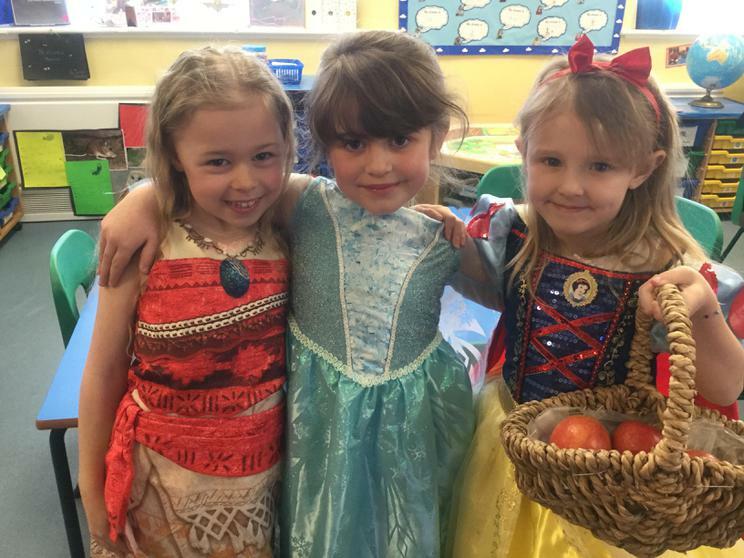 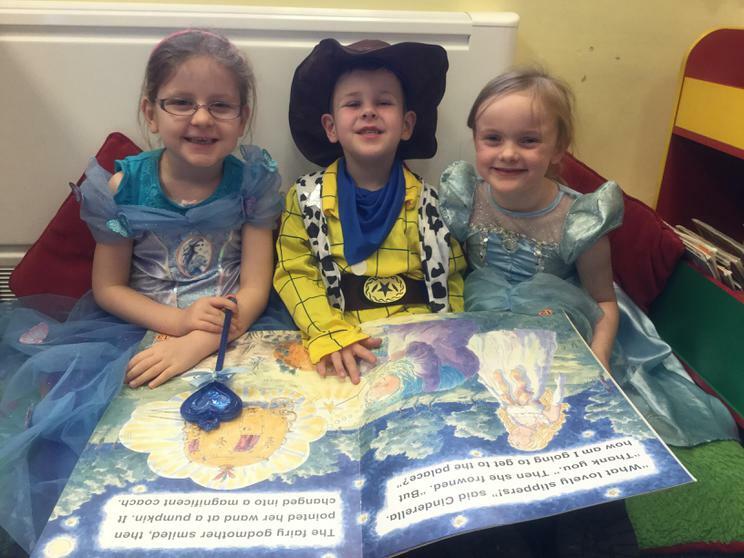 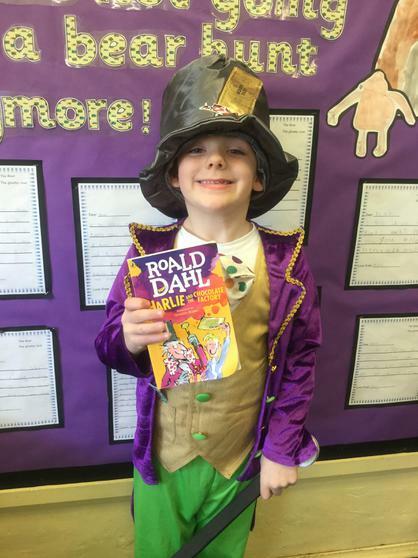 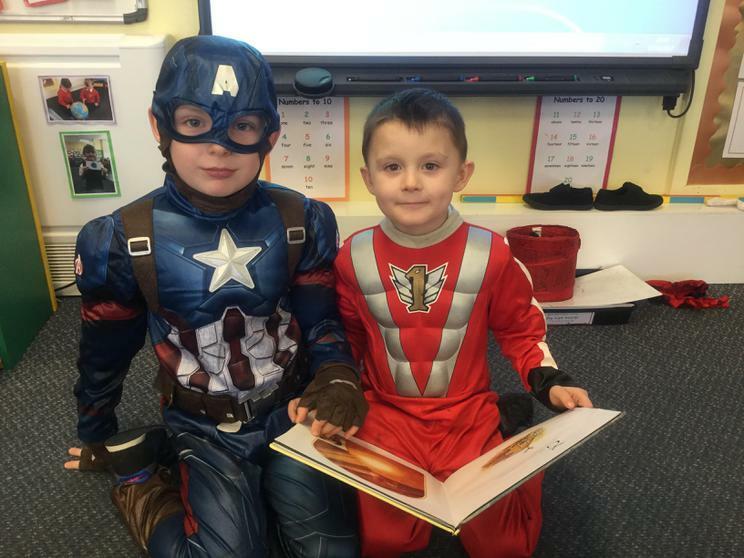 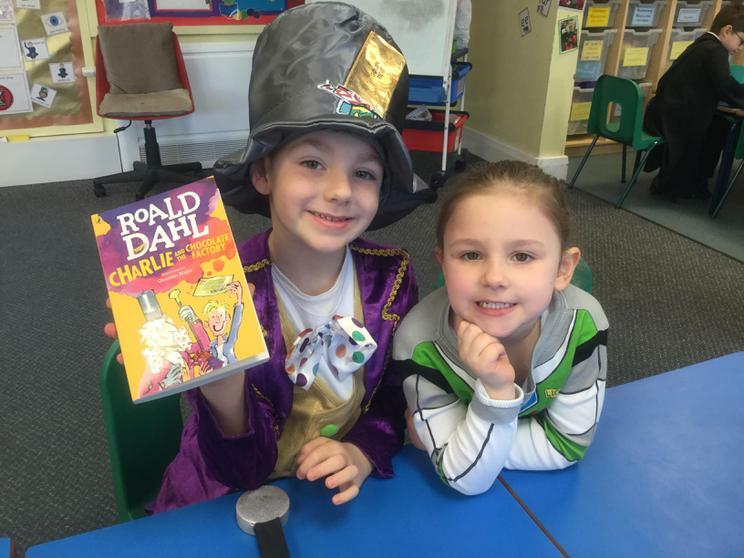 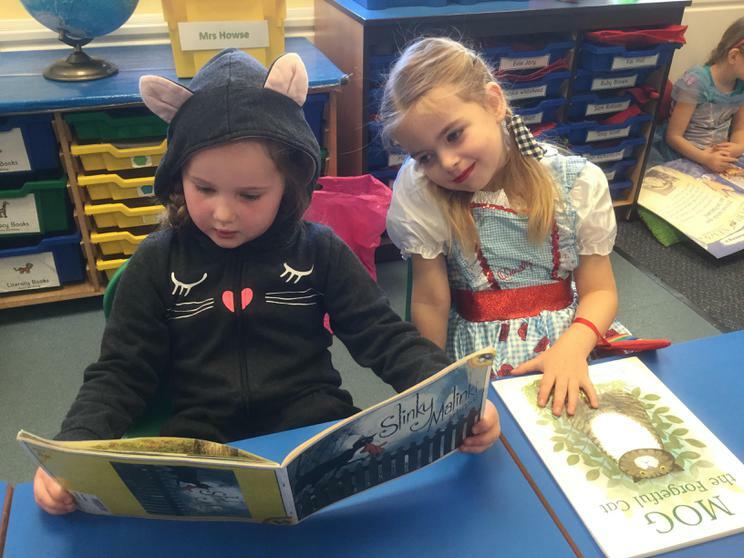 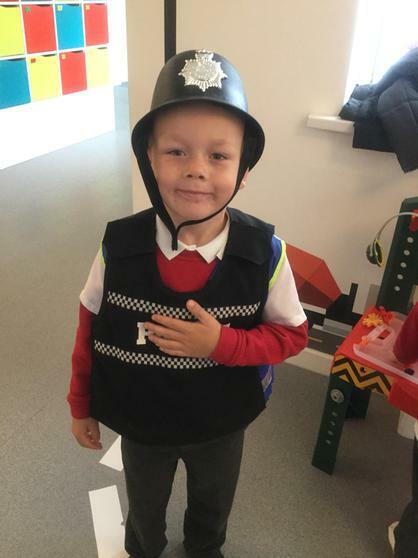 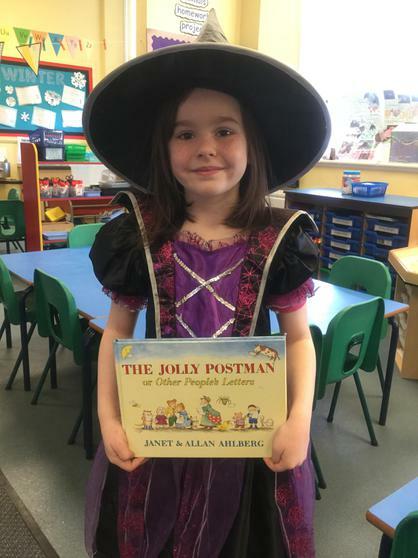 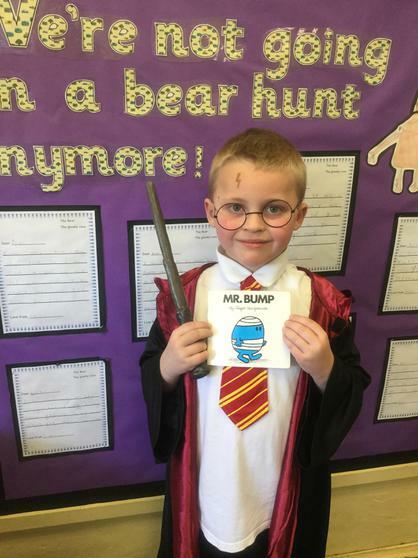 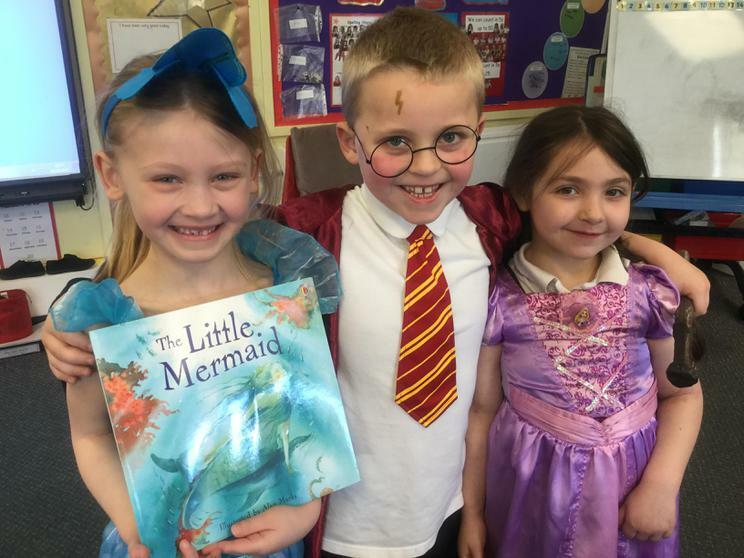 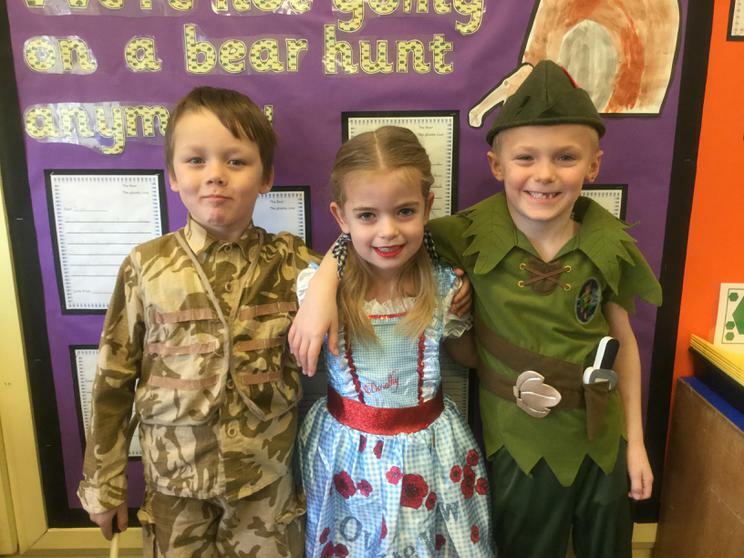 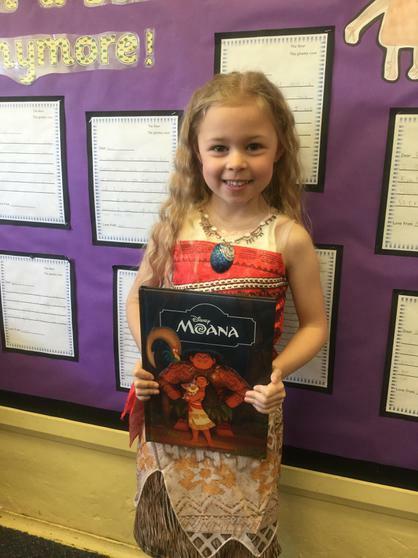 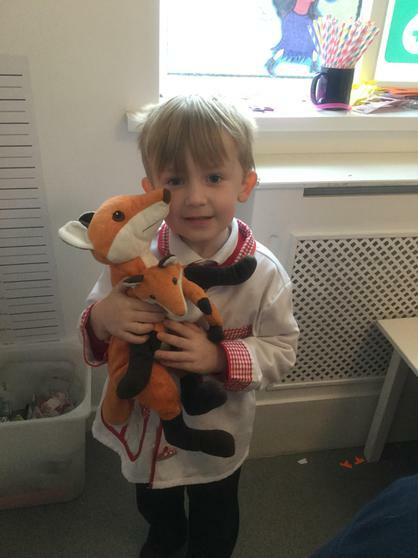 We dressed as our favourite characters from books and films and we shared our favourite stories with our friends and with some of the older children in school. 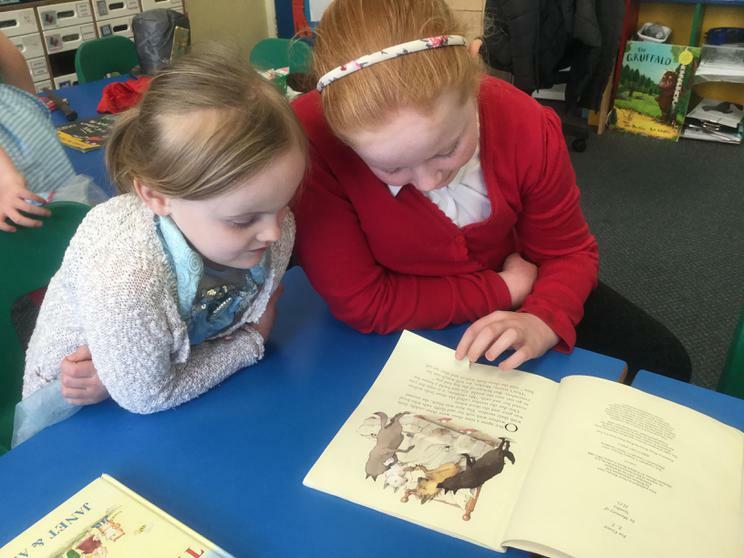 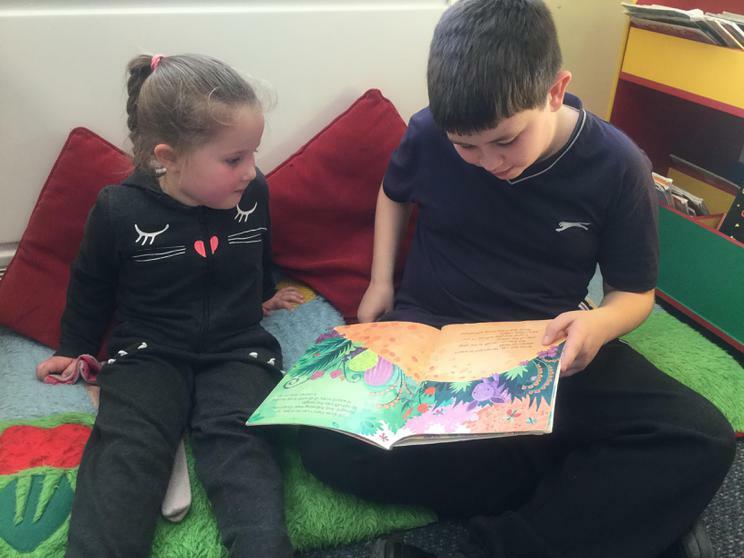 We also got the opportunity to hear the teachers read one of their favourite stories in their classroom. 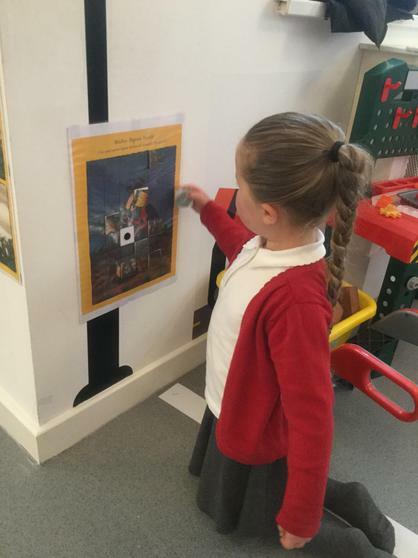 We have learned so many interesting facts about penguins as part of our topic work that we decided to use the Pic Collage APP to show our favourite facts in the style of a poster. 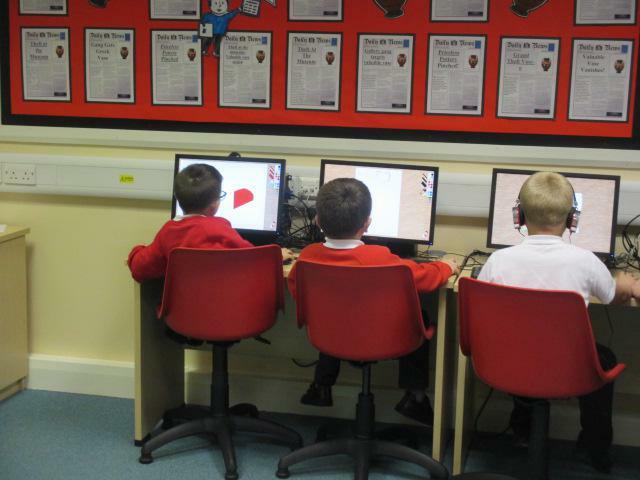 Here are a selection of our finished posters. 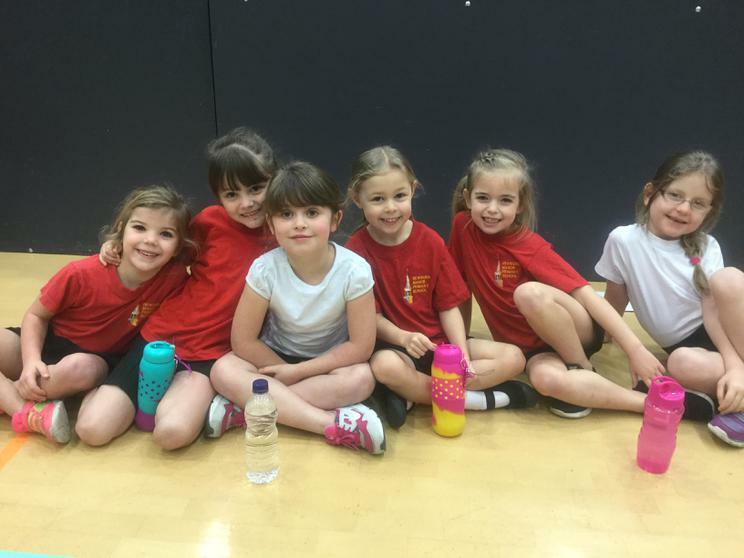 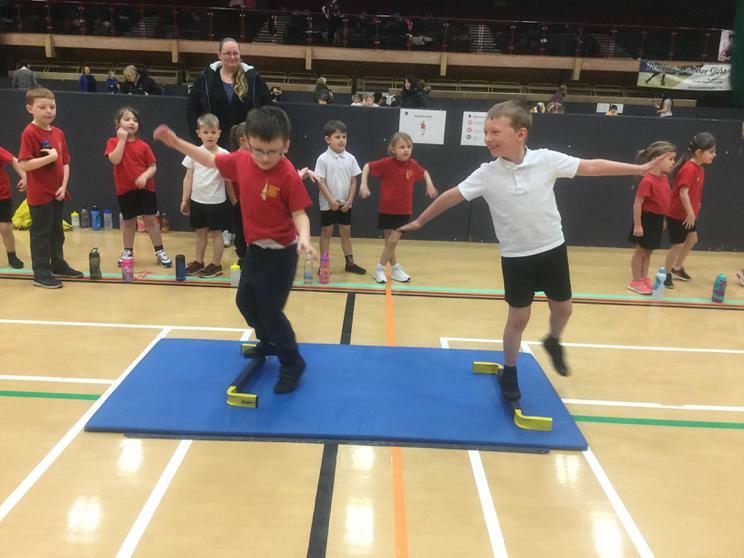 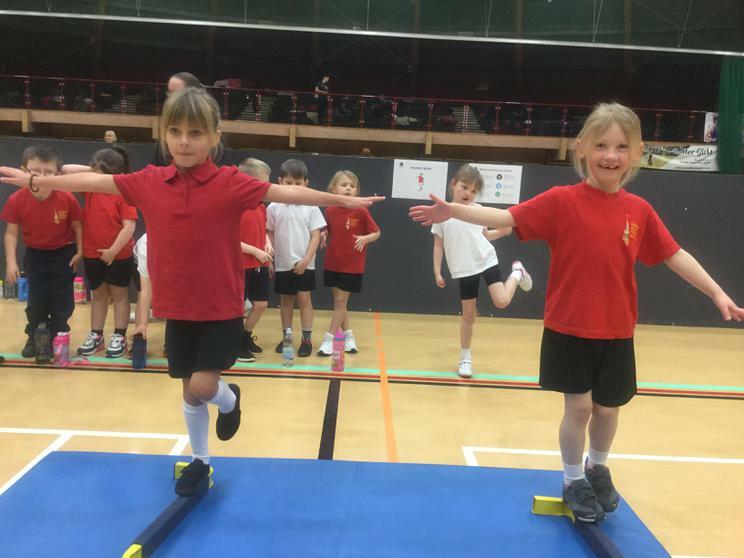 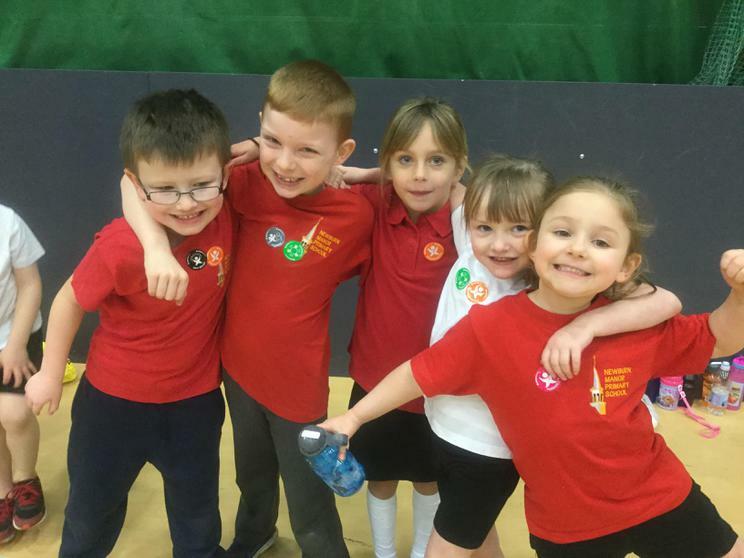 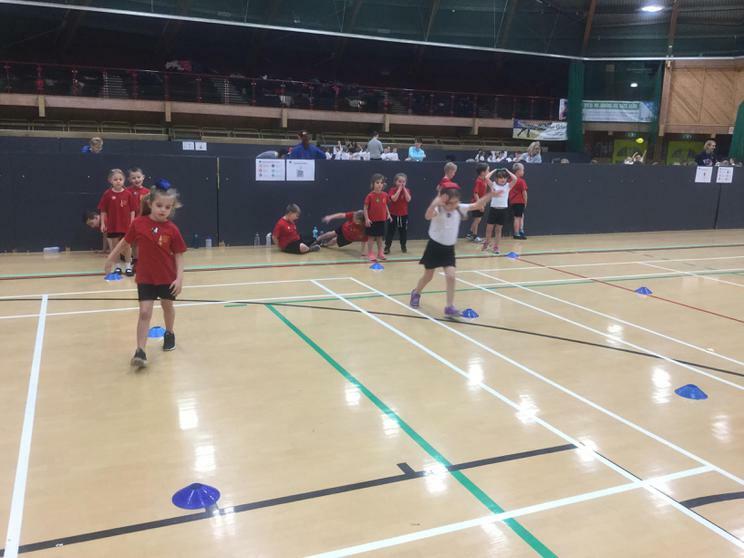 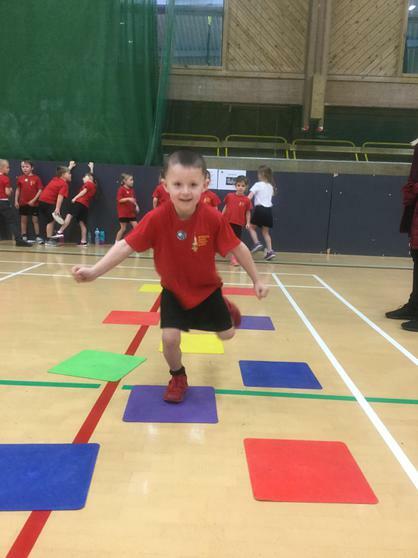 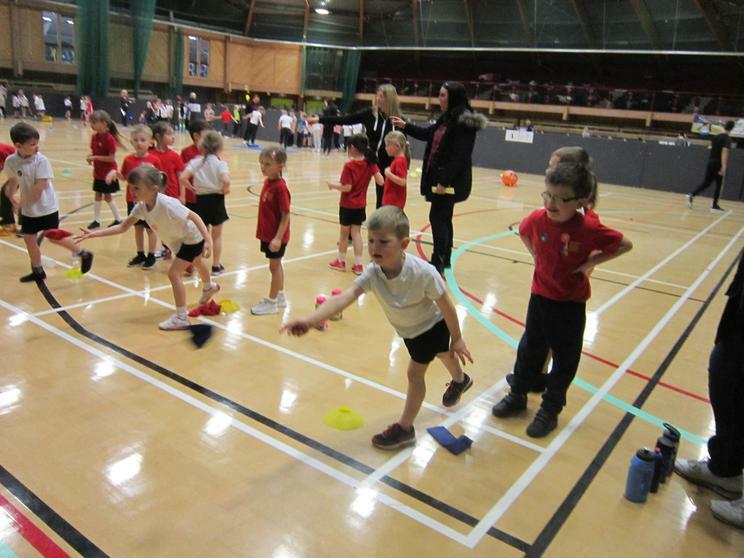 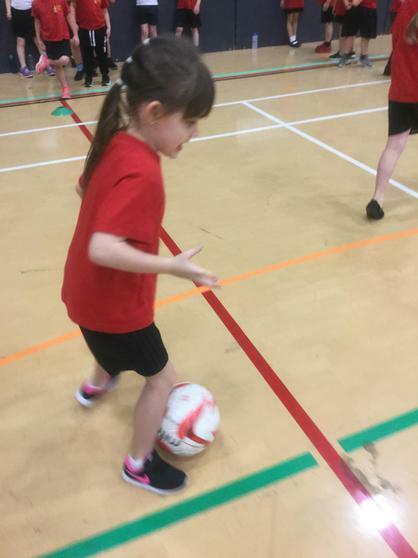 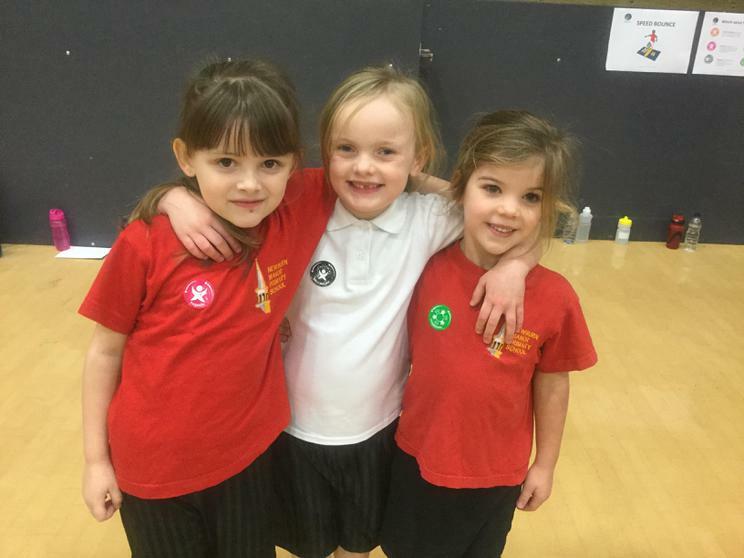 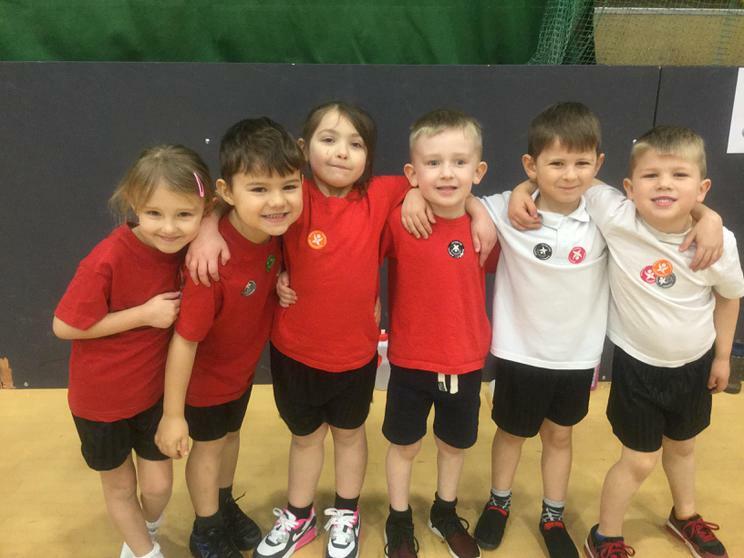 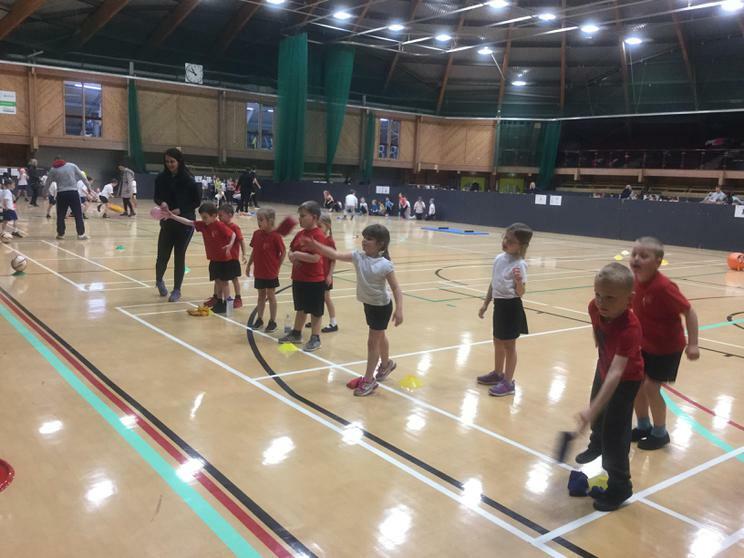 We visited Walker Activity Dome for a multi-skills event with several other primary schools. 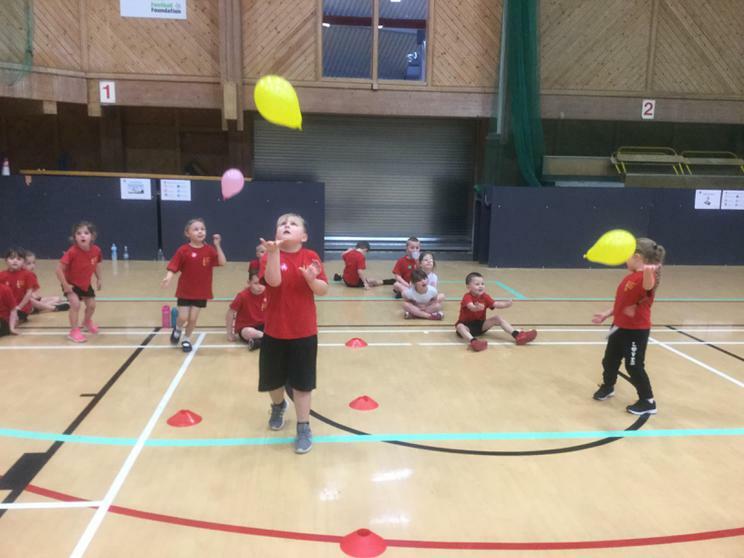 We had great fun balancing on beams, throwing bean bags into targets, dribbling footballs around cones and playing a variety of team games. 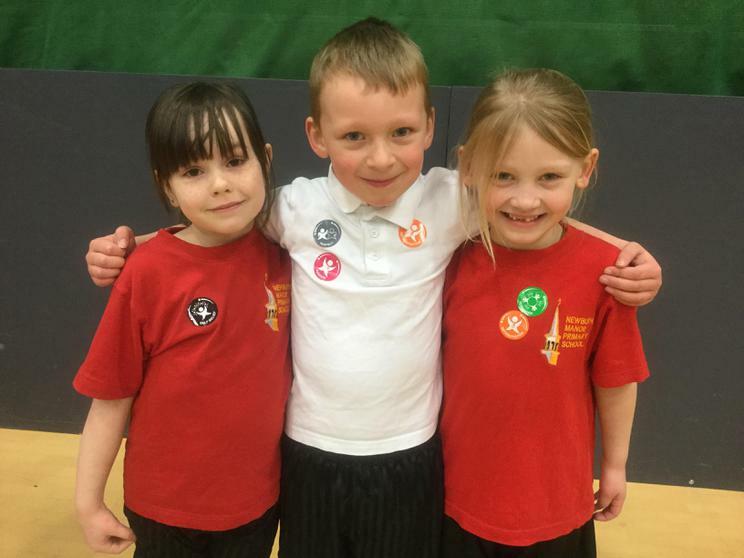 We were awarded special stickers for our performance. 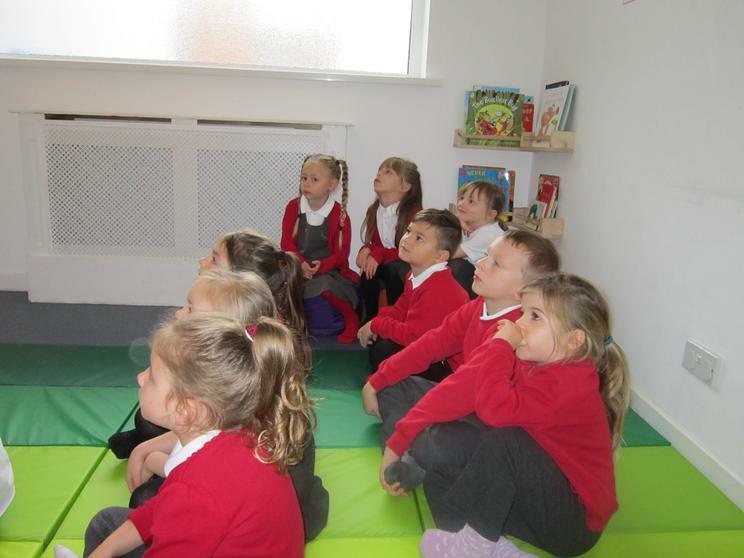 As you can see from some of our photographs, we are very proud of our achievements. 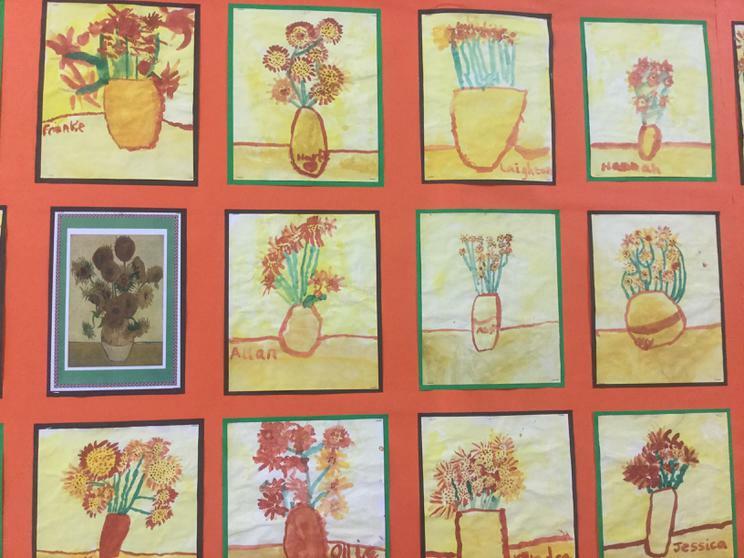 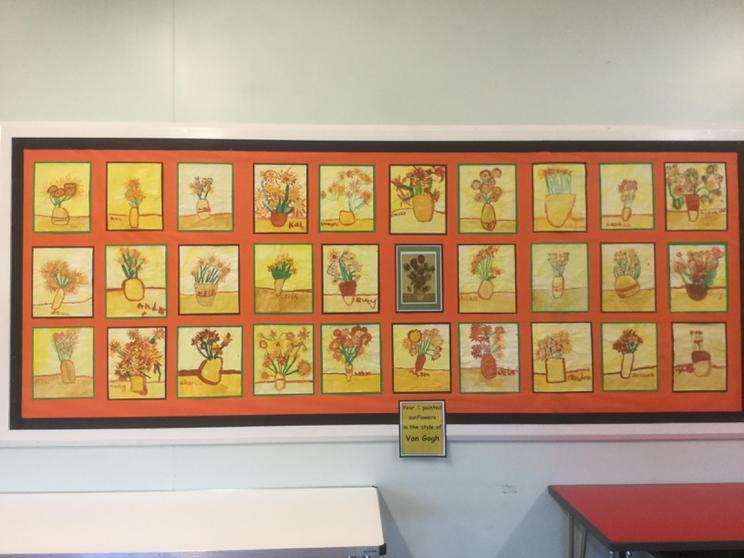 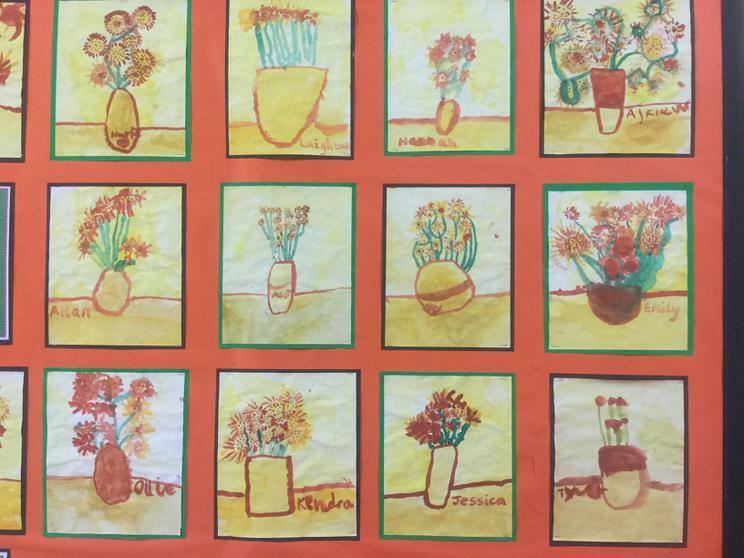 We are so proud of our artwork produced in the style of 'Sunflowers' by Van Gogh. 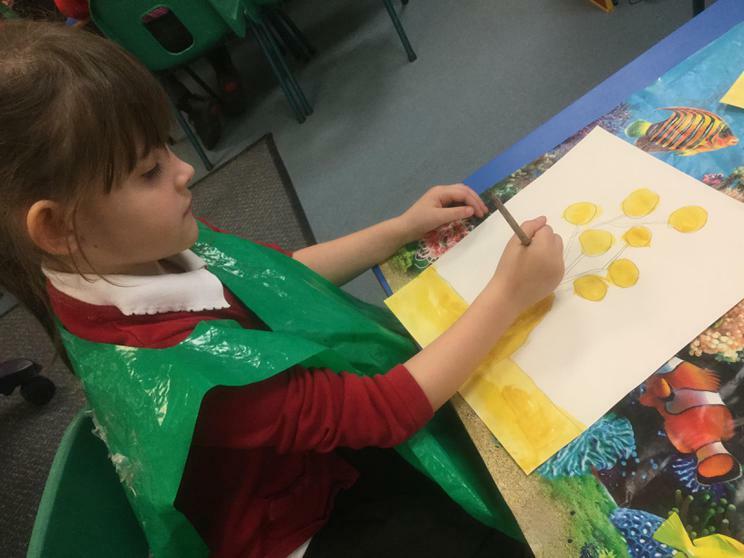 We spent a long time studying the painting and discussing how Van Gogh's painting style was quite different to that of other artists at the time. 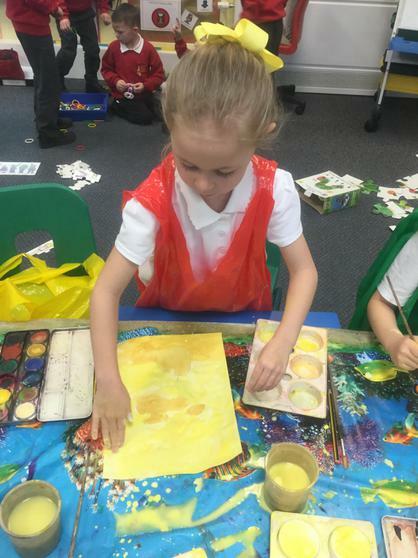 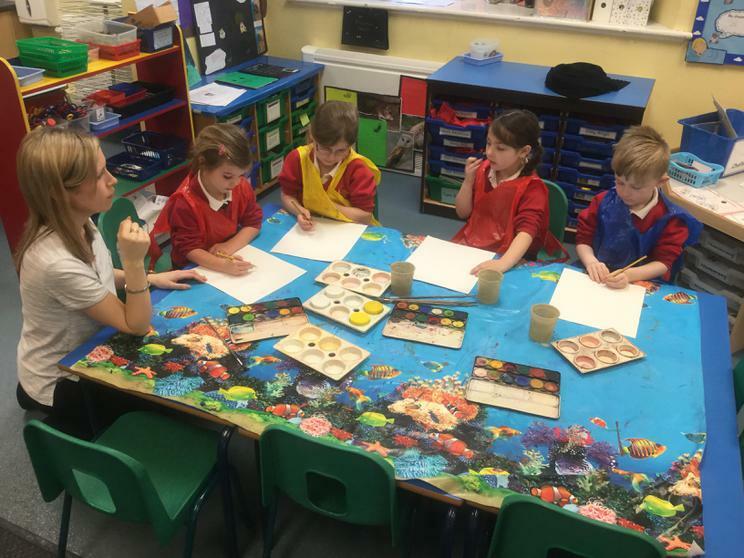 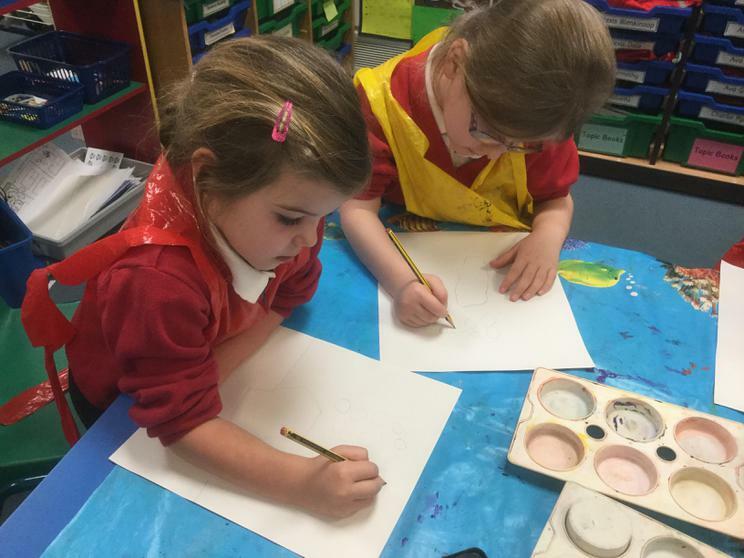 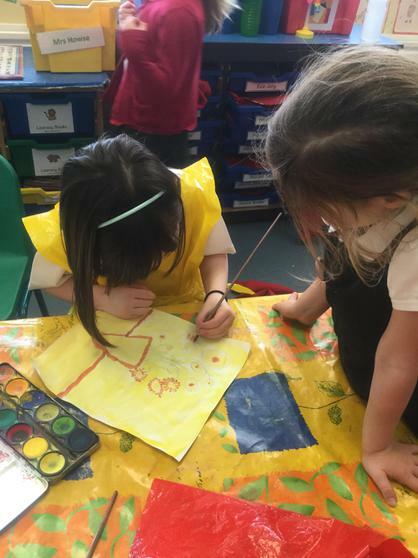 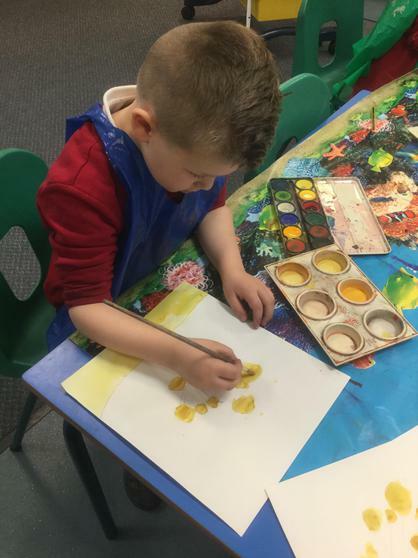 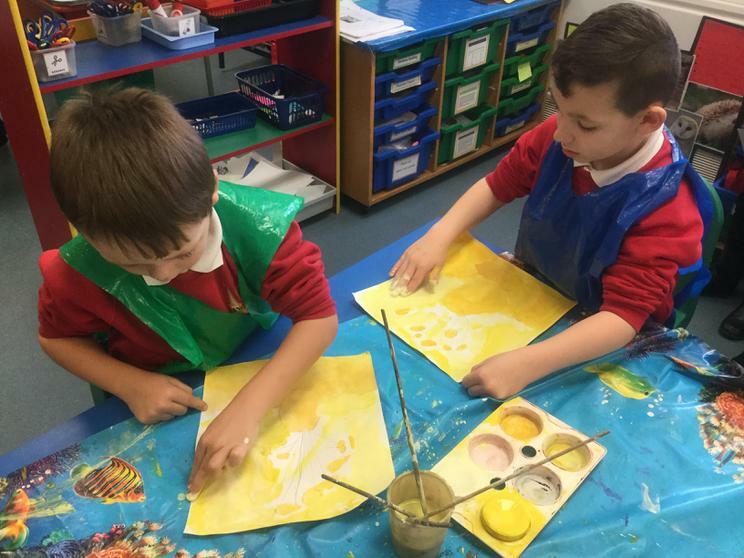 We used watercolours to produce our artwork and mixed colours to make different shades of yellow. 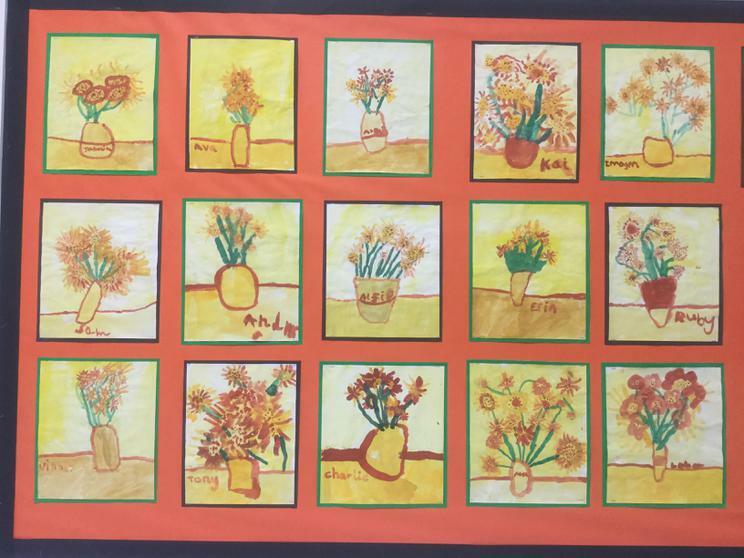 Our paintings are now displayed in our dining hall for all to see. 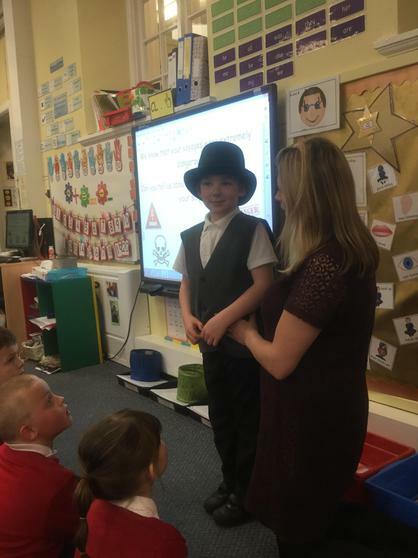 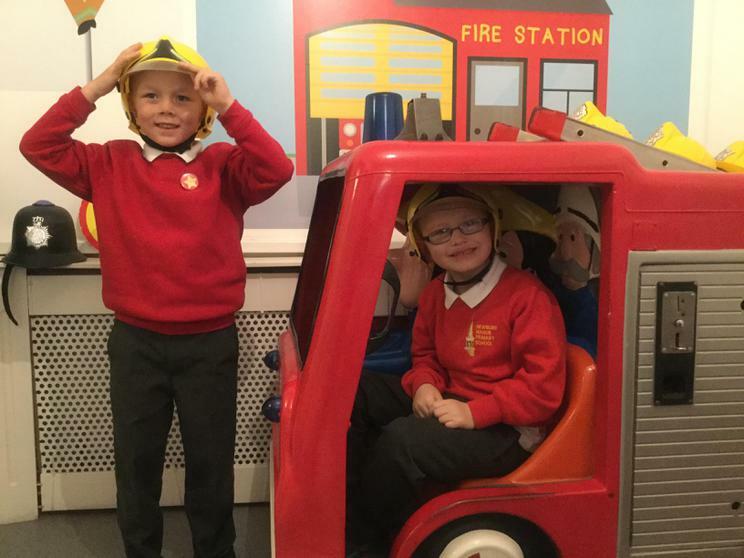 Thank you to all the adults that visited our class for 'Come and See'. 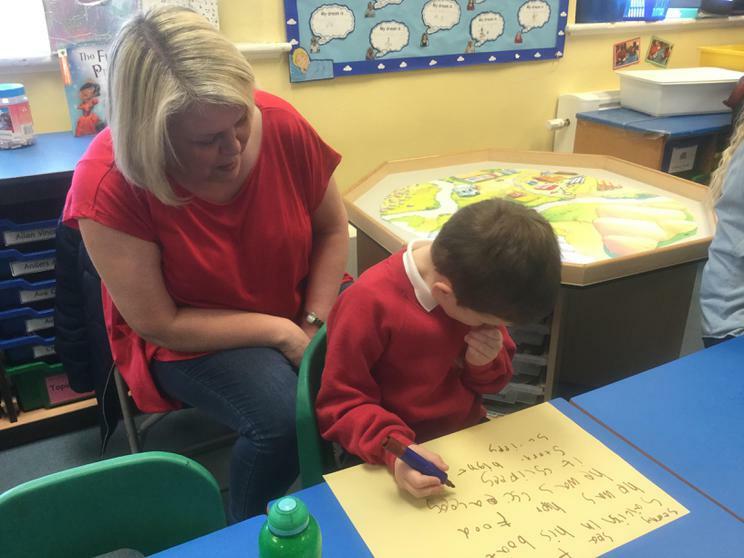 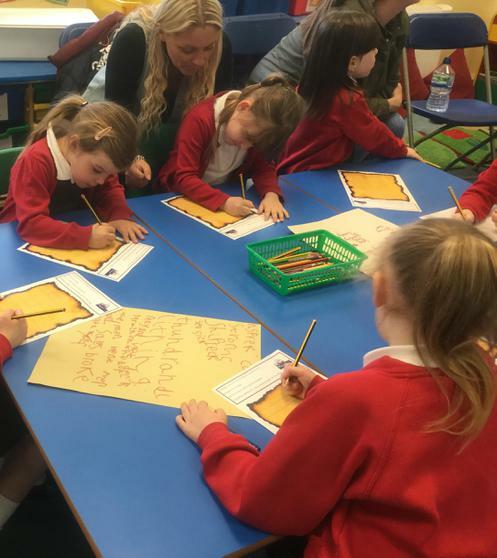 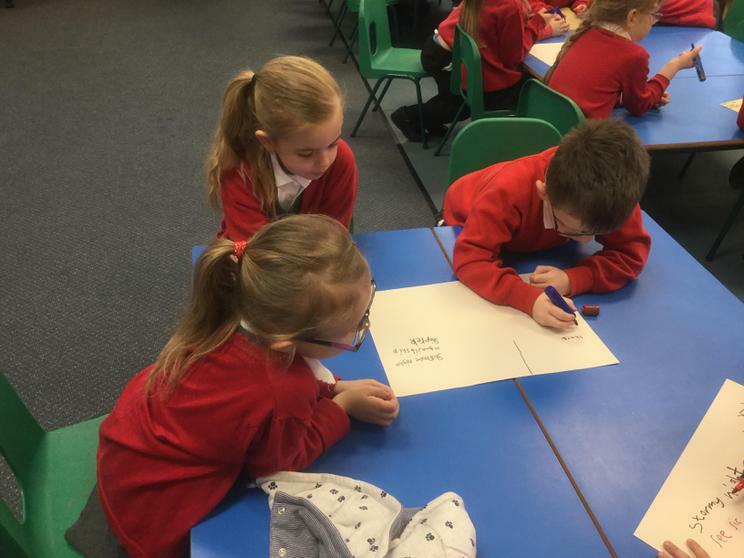 We had a lovely morning writing the beginning of our stories based on the book, 'Can't You Sleep Little Bear'. 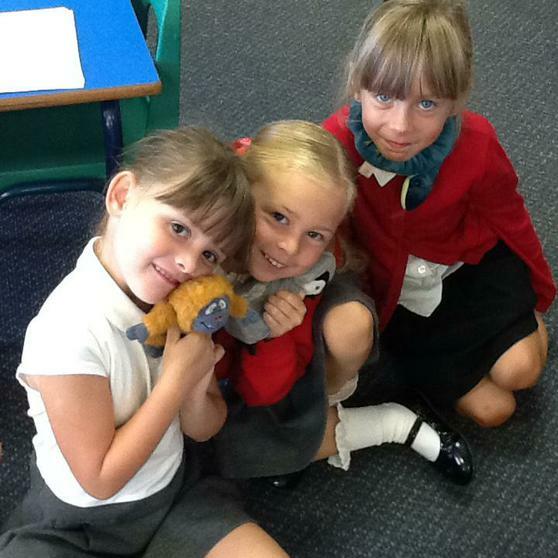 We used adventurous story openers and we rehearsed our ideas with an adult before introducing our characters. 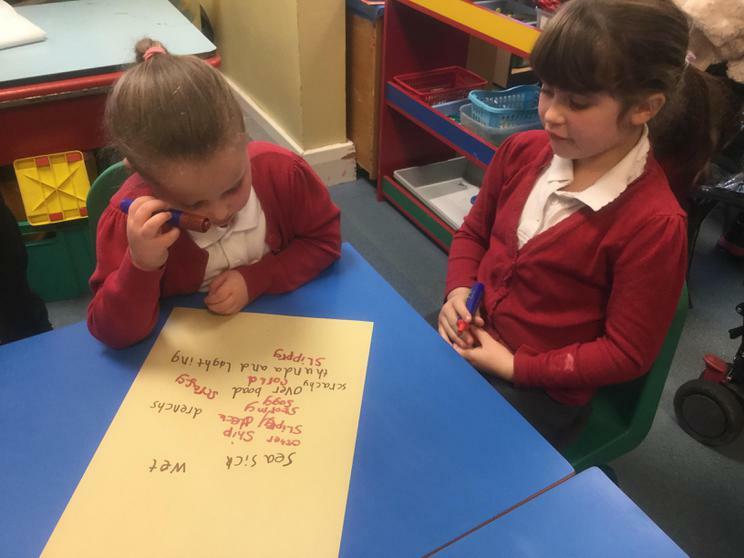 In Maths we practised counting in 5s before totalling 5p coins in purses. 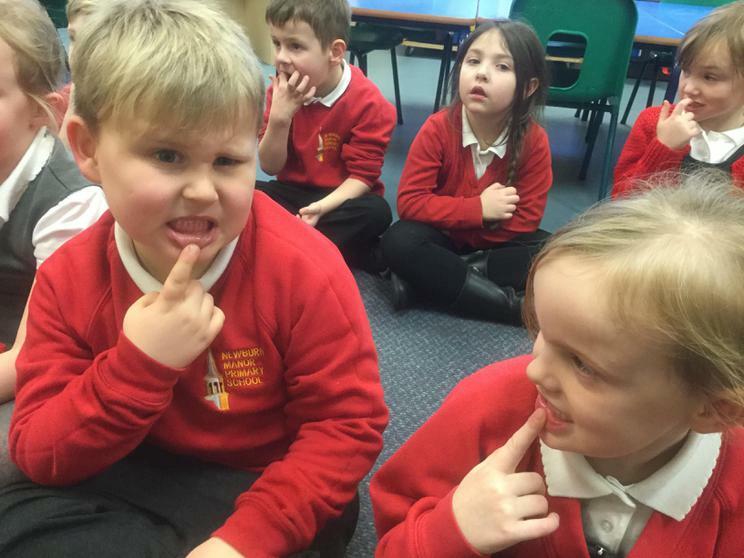 The adults were really impressed with how far we could count in 5s! 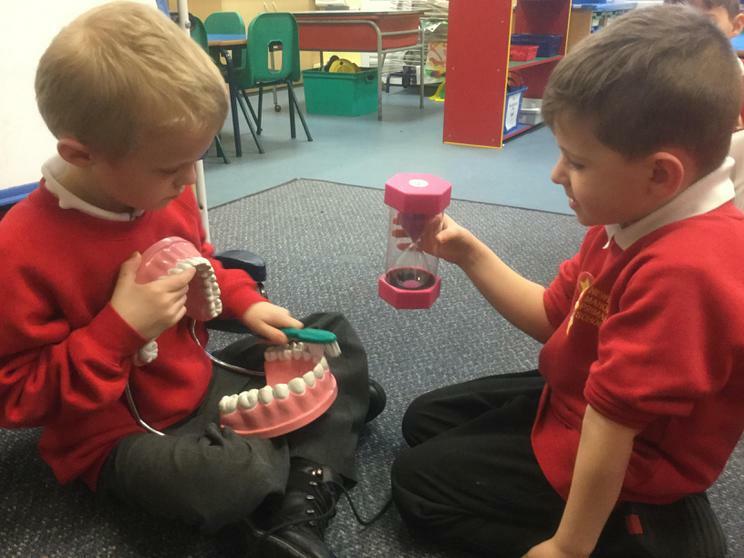 We have been learning about teeth and how our first teeth are replaced by a second set of permanent teeth as we grow up. 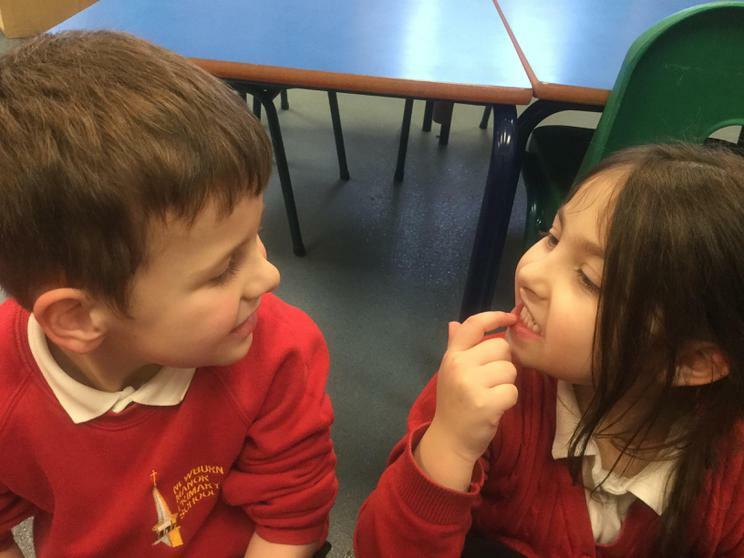 Our special visitor, Melanie, explained how to brush our teeth properly so that our teeth and gums will stay healthy. 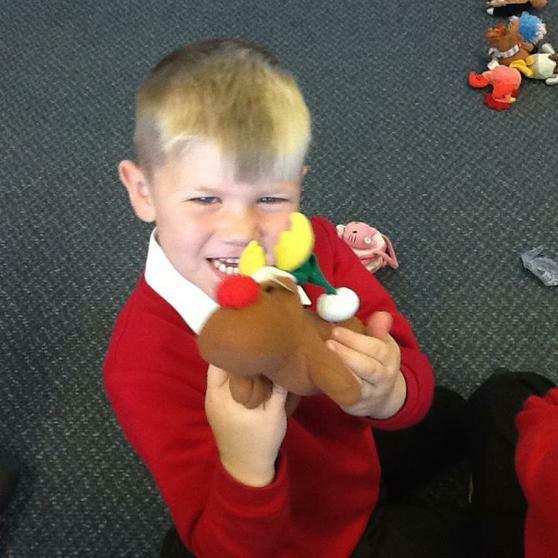 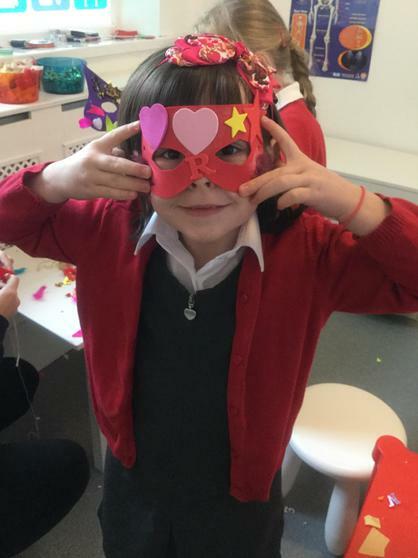 We had lots of fun dancing, playing games and eating yummy food at our Christmas party. 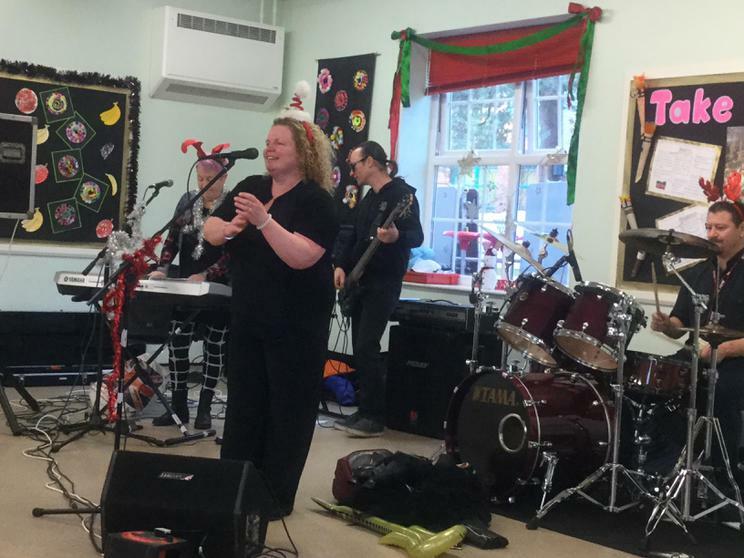 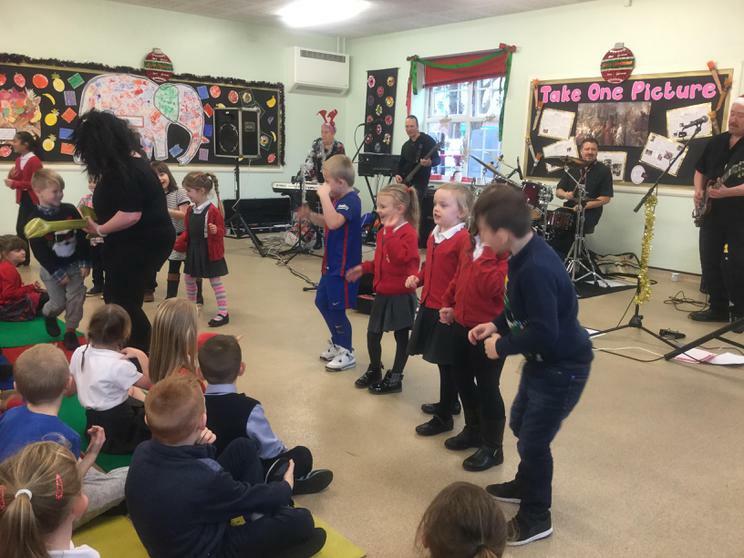 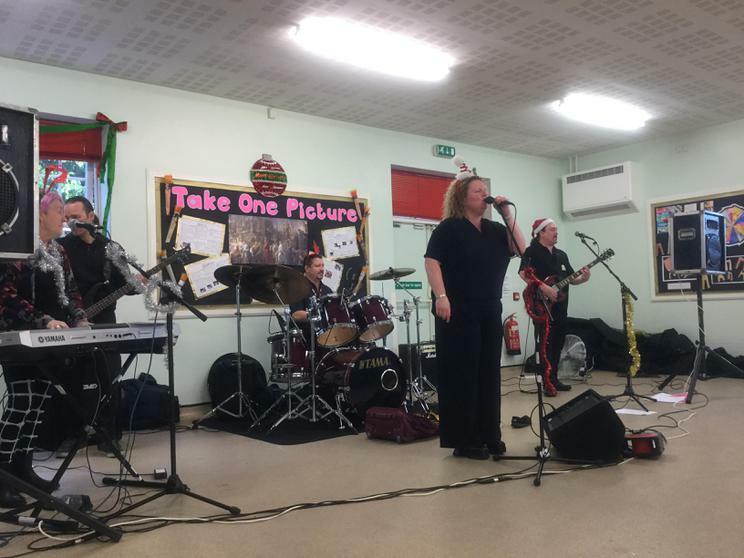 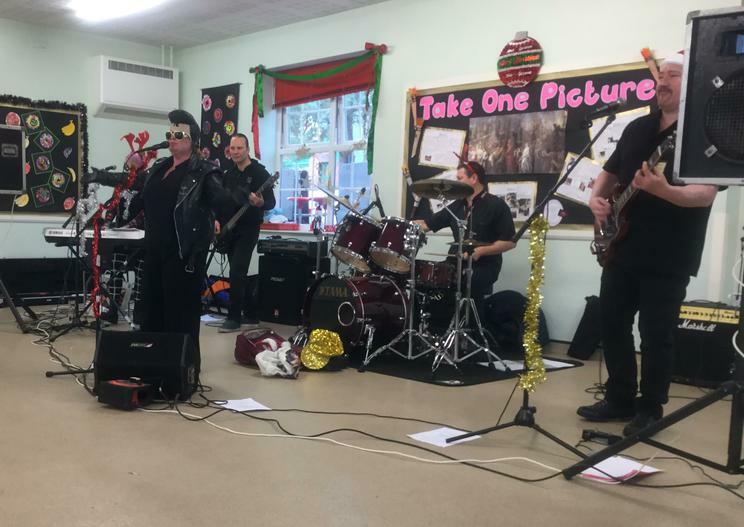 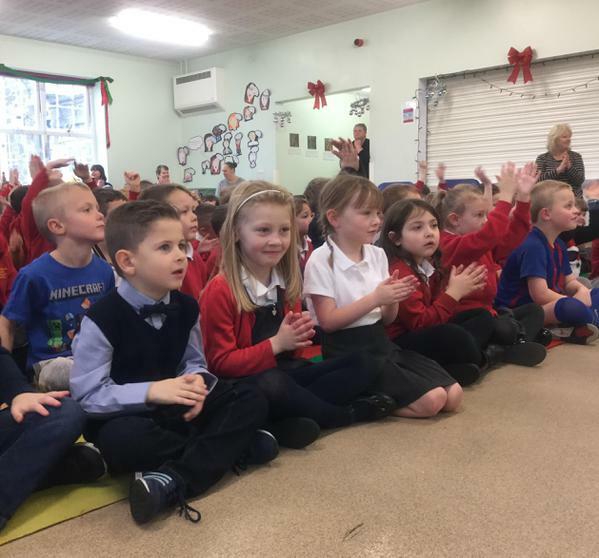 We had a fantastic time singing and dancing to all the Christmas songs with Hot Shots band this week. 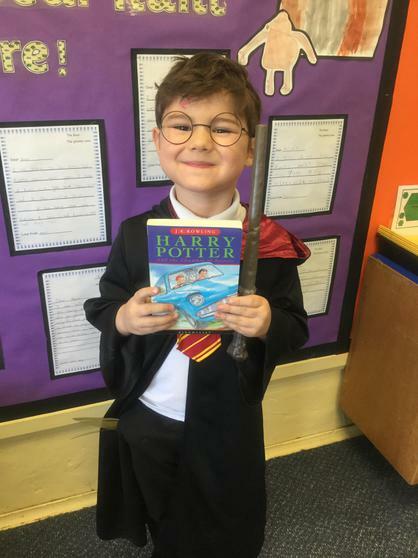 What a treat for us all. 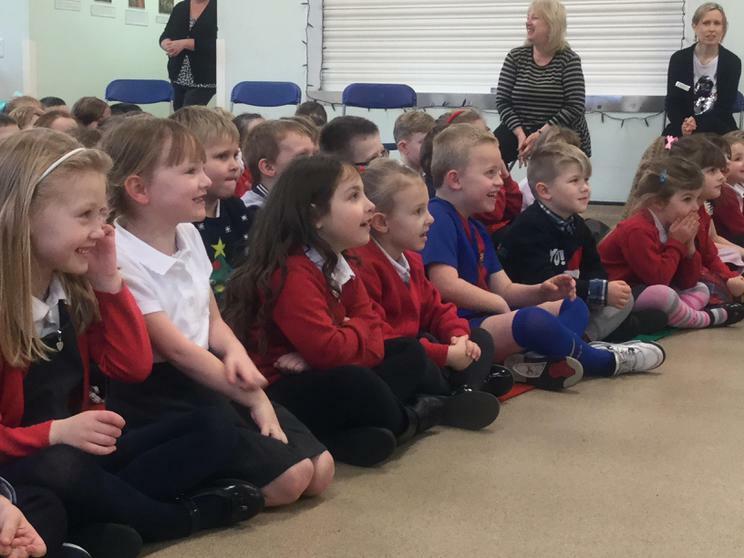 We had front row seats, too! 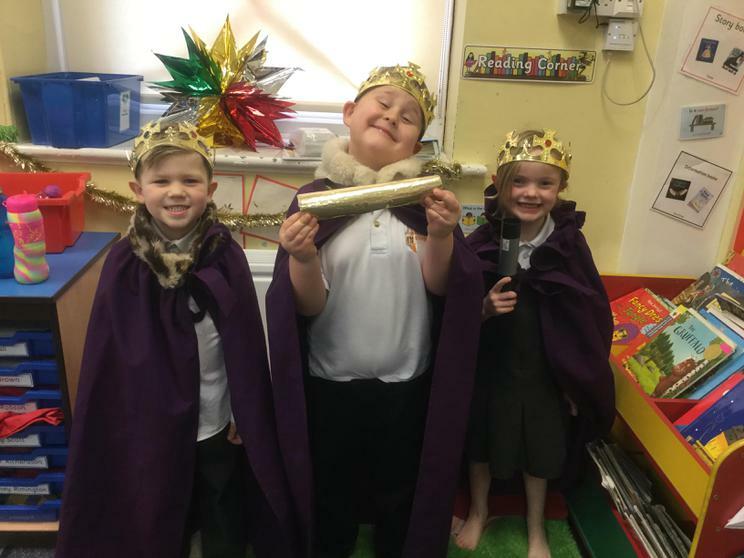 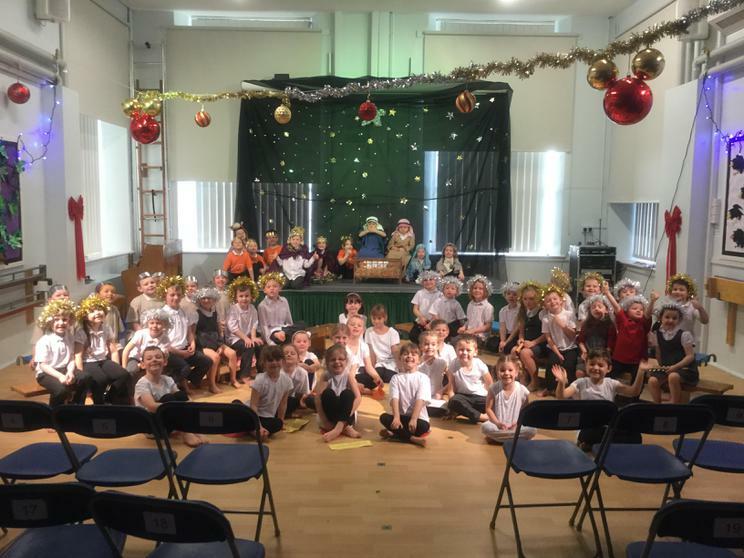 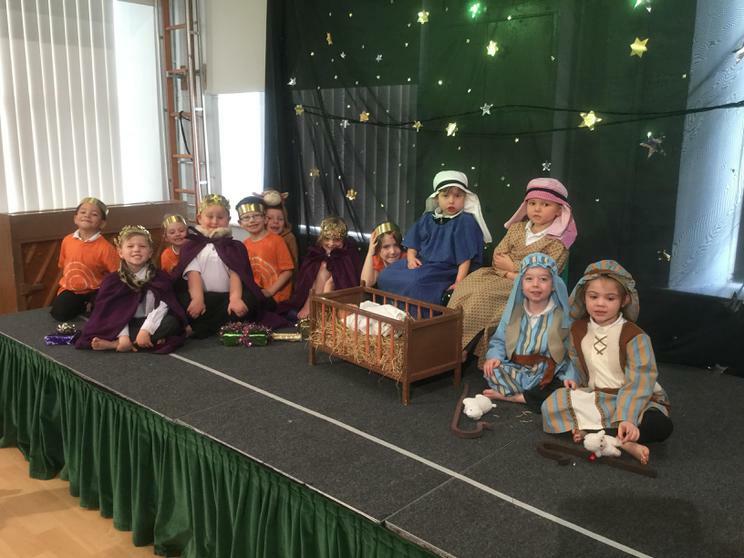 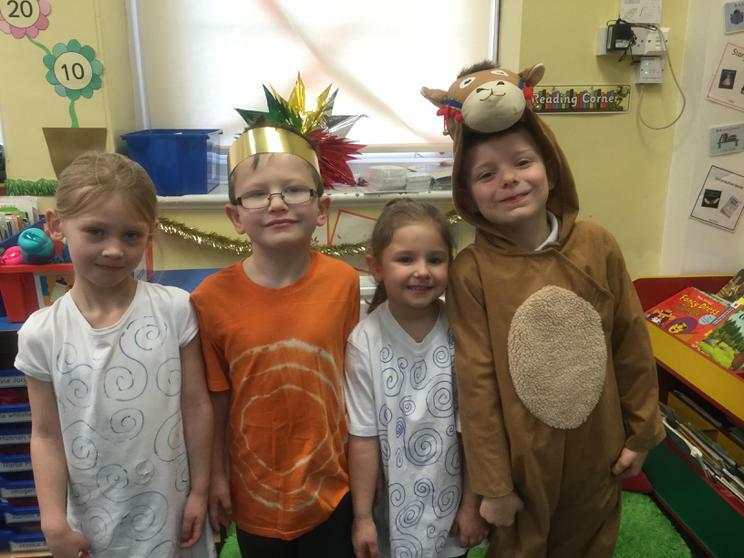 We had an amazing time performing 'We Three Kings' to the school and our families last week. 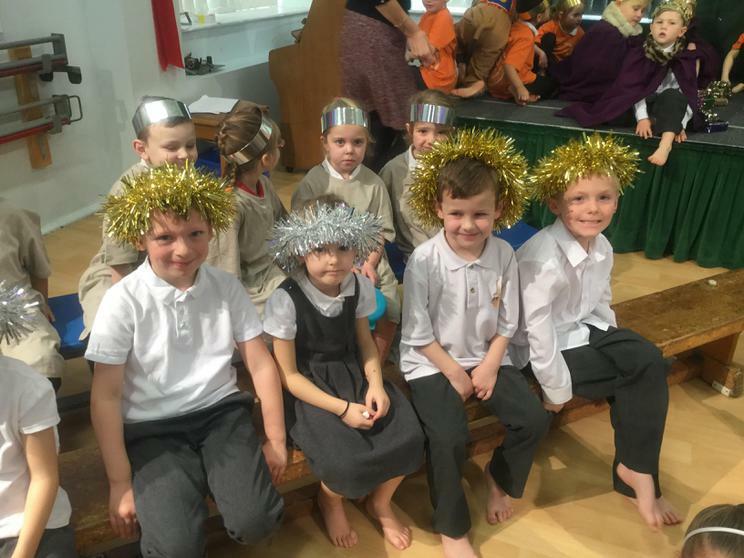 Our narrators learned lots of lines by heart, our choir lead the way singing all the lyrics to our Christmas songs and our actors were fantastic. 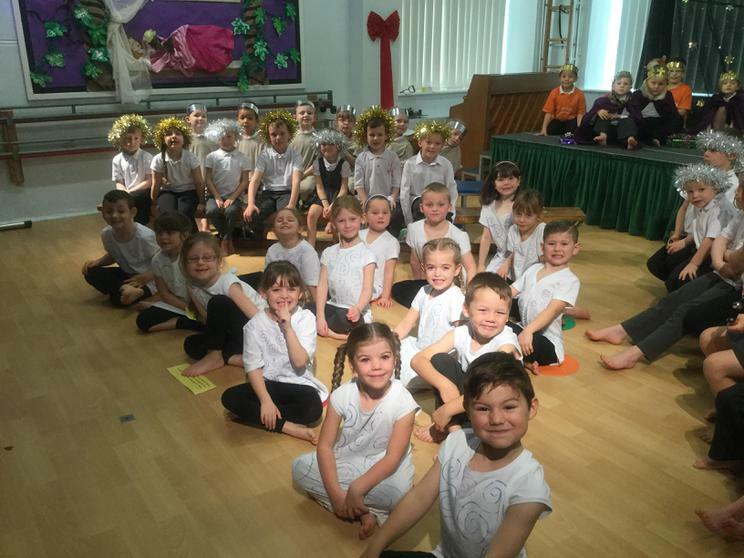 Our teachers were very proud of us! 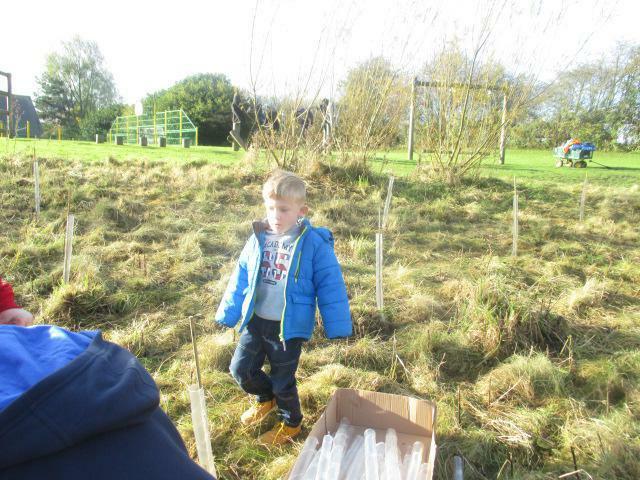 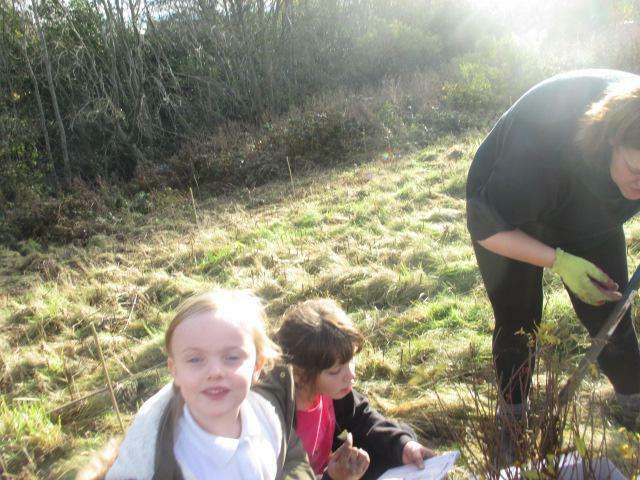 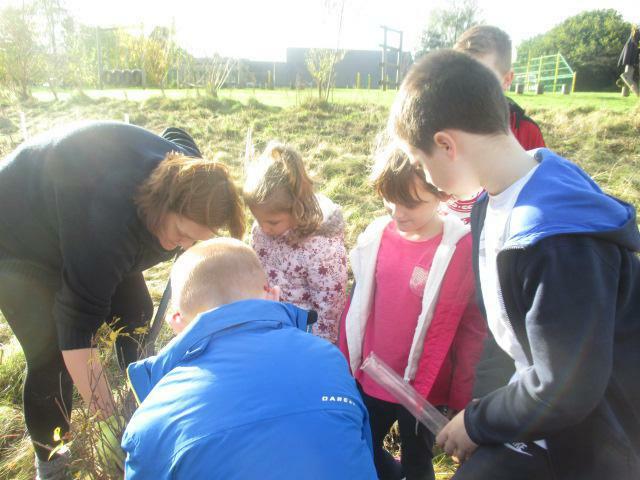 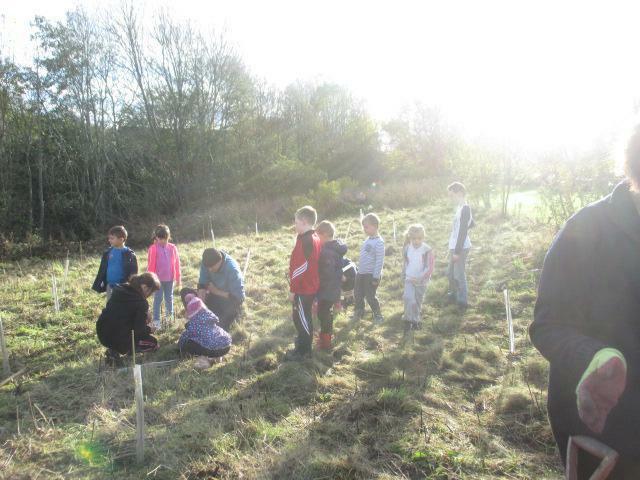 We had a lovely morning planting trees with Mr Vyle and some of our Y6 children. 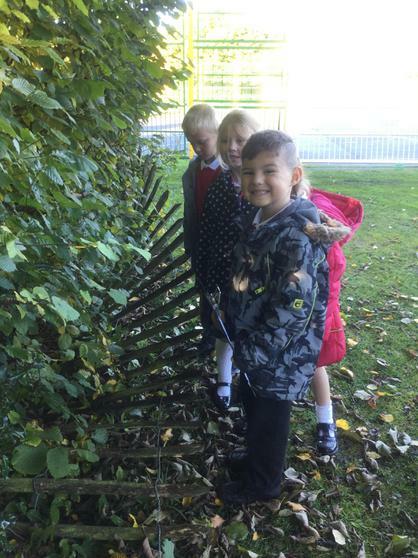 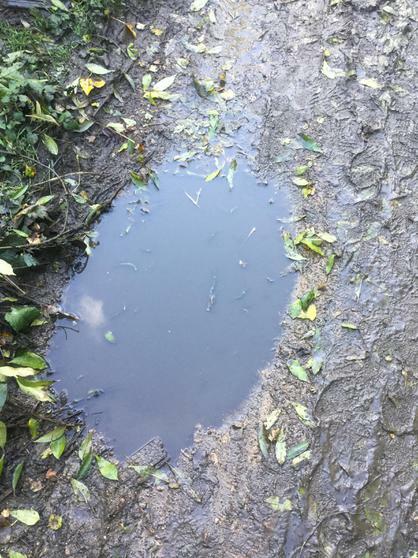 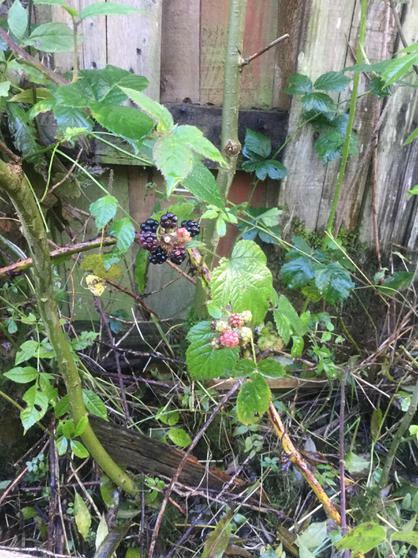 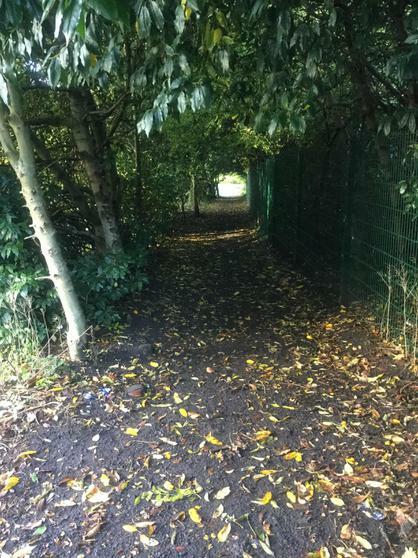 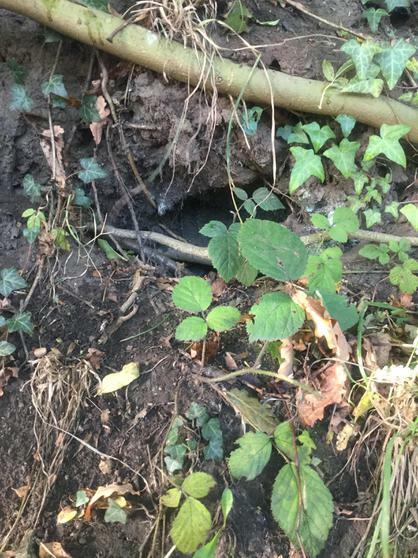 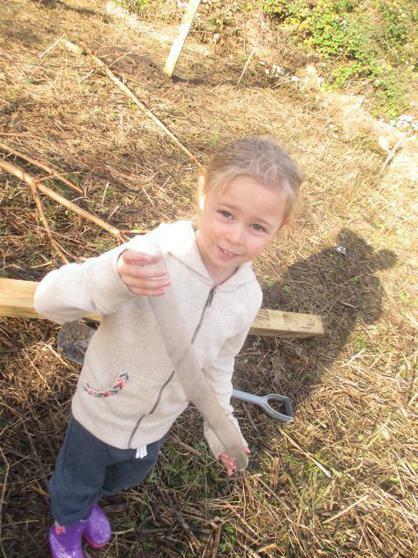 This is to make our very own Forest School area. 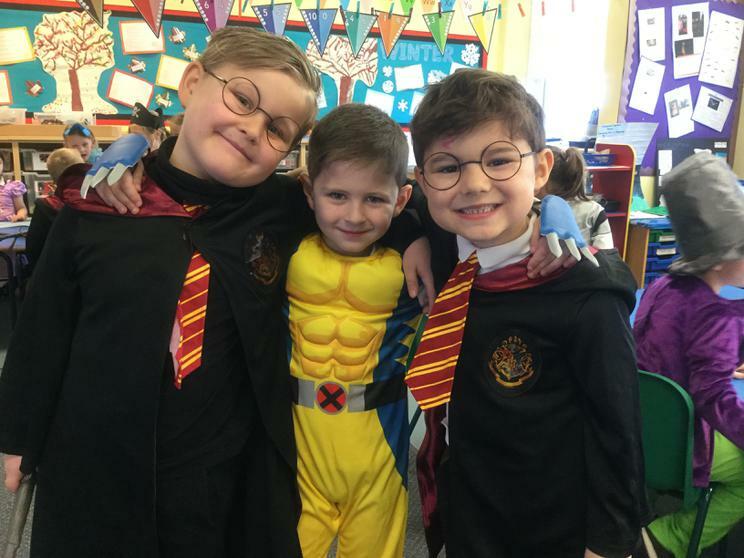 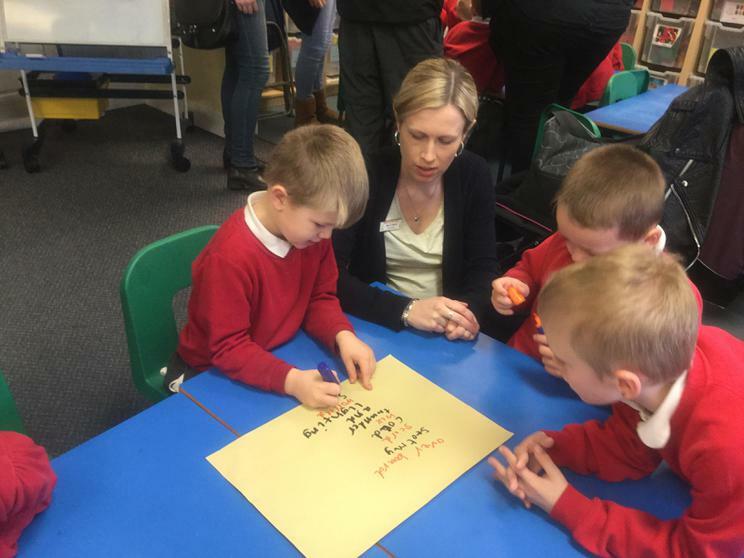 We had a fantastic time during our Super Learning Day. 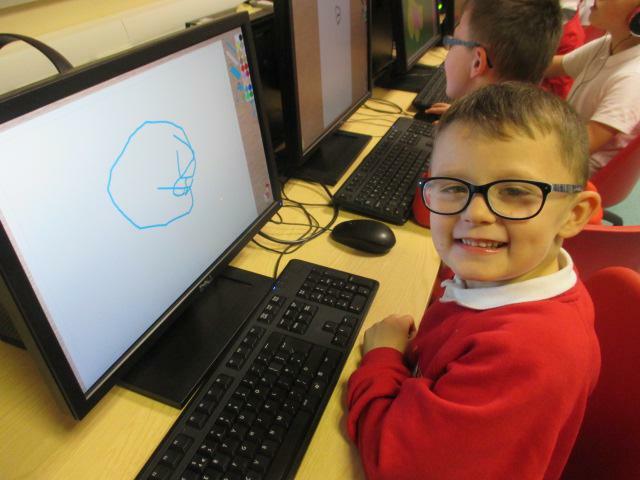 We learned all about 'The Gun Powder Plot' and Guy Fawkes and we enjoyed watching and taking part in a science-based workshop with Technology Tom. 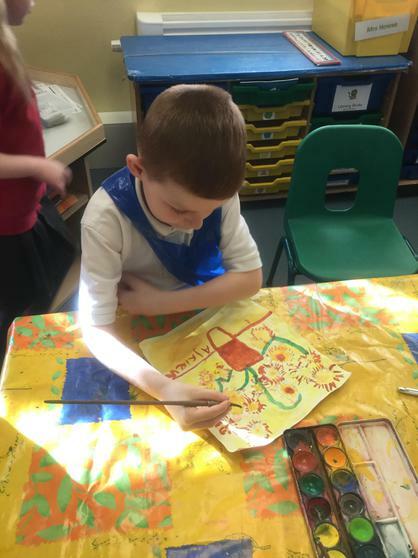 We created bonfire paintings using our hands to print and we made sparklers using tinfoil and glitter. 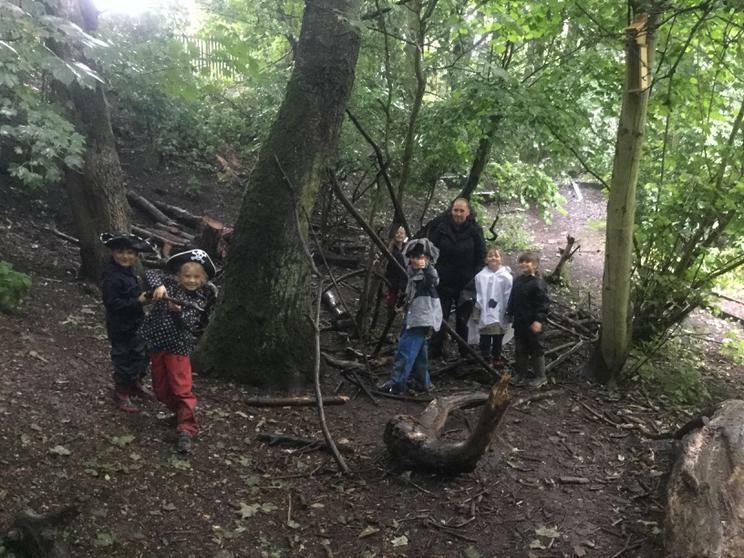 We also had great fun pretending to be Guy Fawkes and his friends rolling the barrels of gunpowder under the Houses of Parliament. 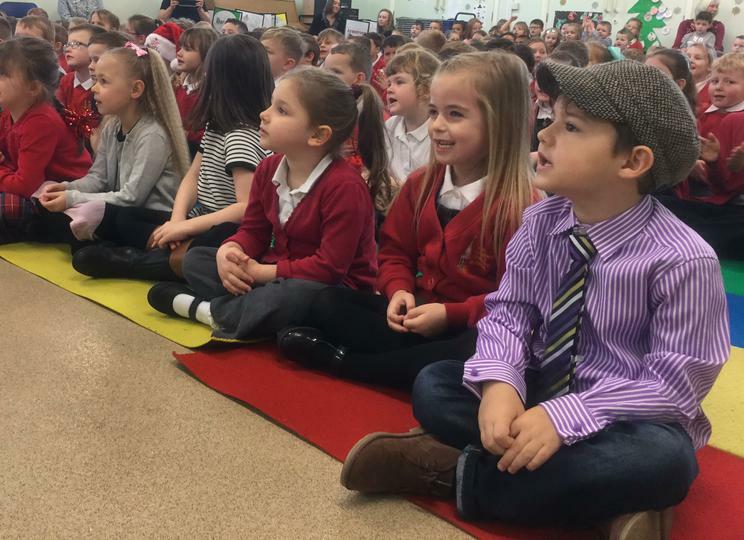 What an exciting day we all had! 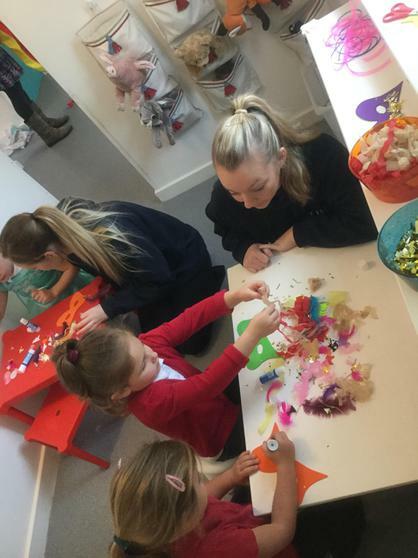 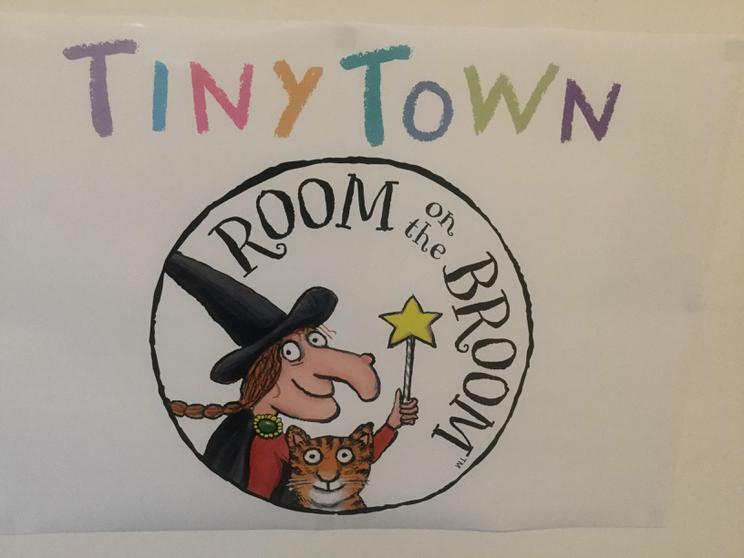 We had a fun-filled morning at Tiny Town for a 'Room on the Broom' workshop. 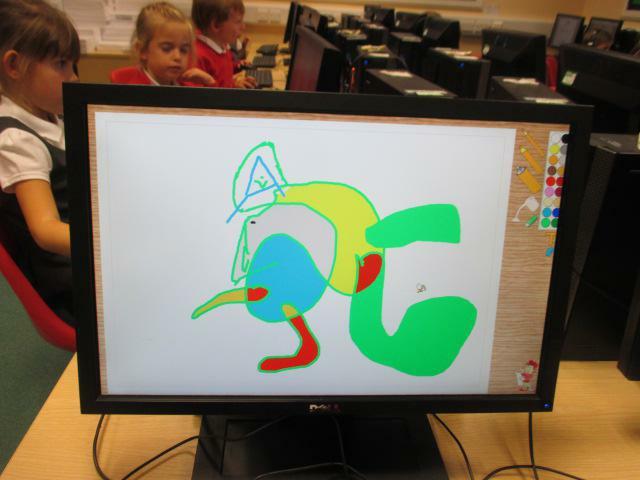 We watched an animation of this fantastic story and played exciting games. 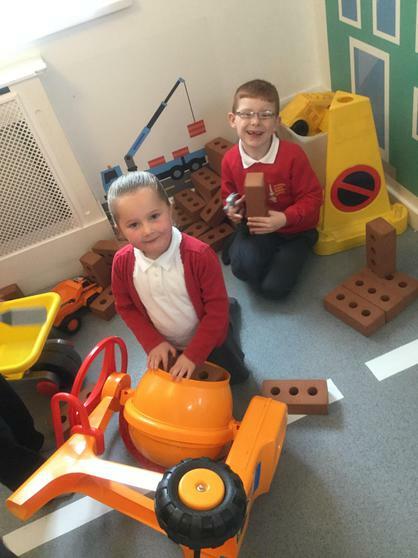 One of our favourite parts of the morning was having the opportunity to play in the Tiny Town play area. 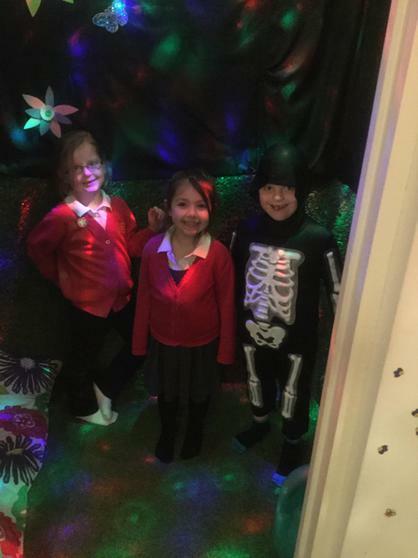 We had so much fun that we didn't want to leave! 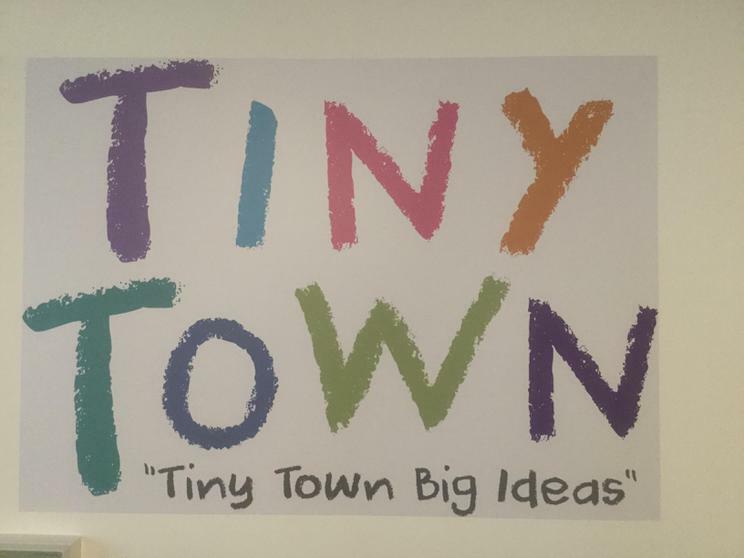 We would love to visit Tiny Town again. 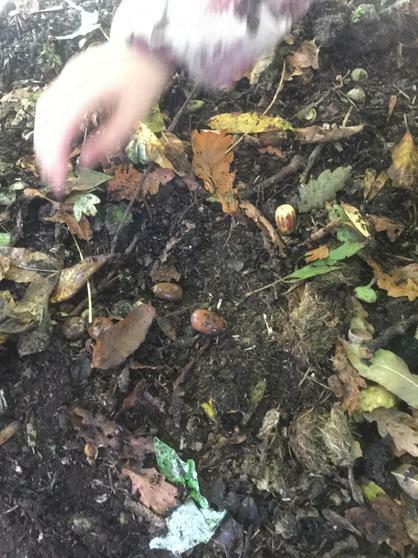 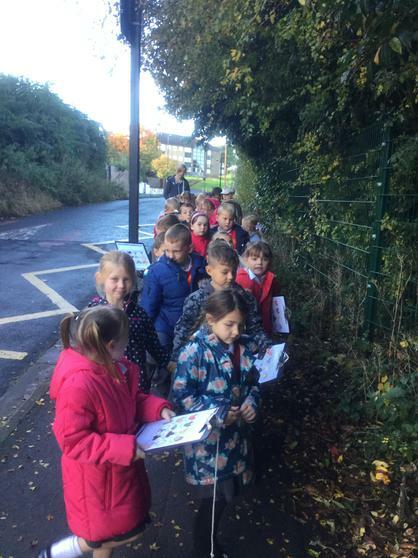 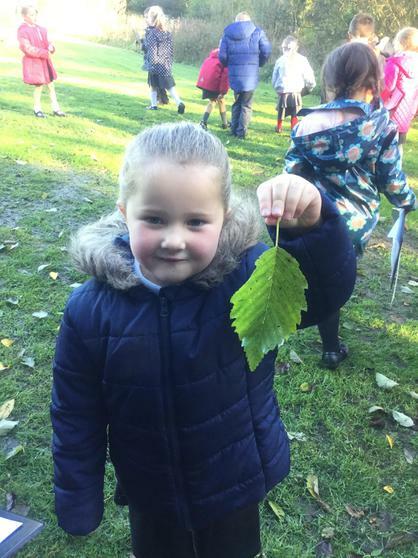 We had great fun today taking a walk around our school and spotting the signs of autumn. 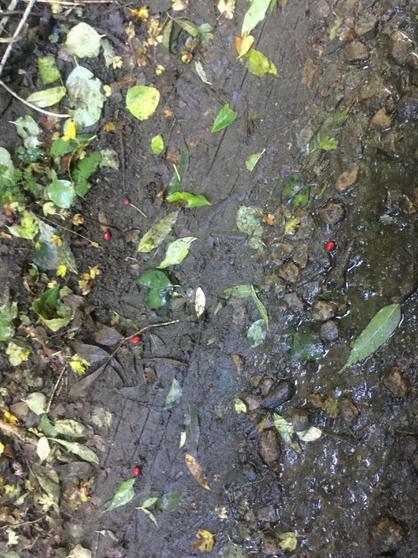 Can you spot some of the signs of autumn in our photographs? 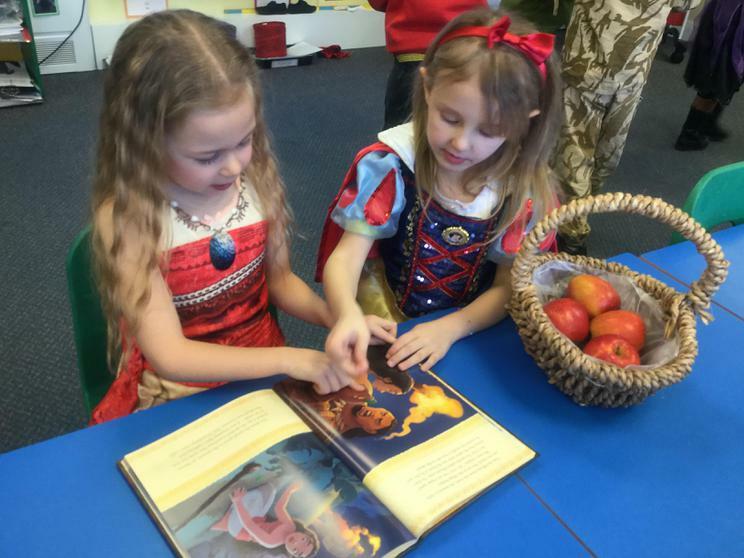 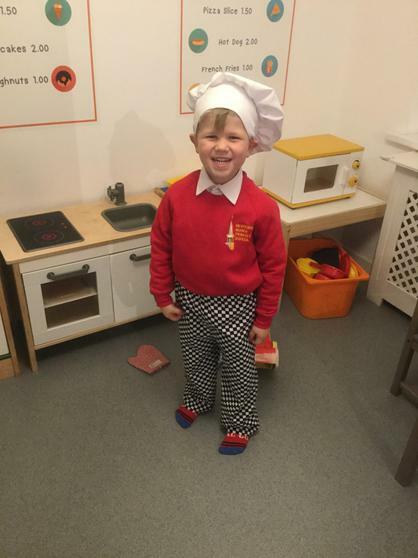 We loved reading the story of 'Oliver's Vegetables' as part of our English curriculum and our Harvest celebrations. 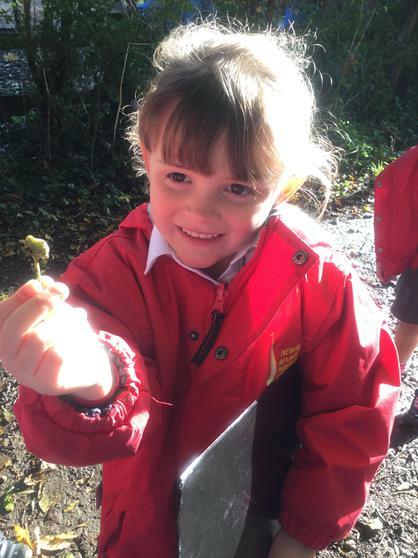 We found out that Oliver's Grandpa grows lots of delicious vegetables in his garden. 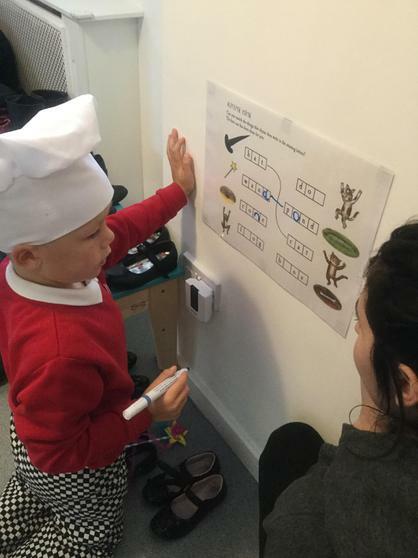 Oliver only wants to eat chips at Grandpa's house but his Grandpa convinces him to try new foods from his garden during his visit. 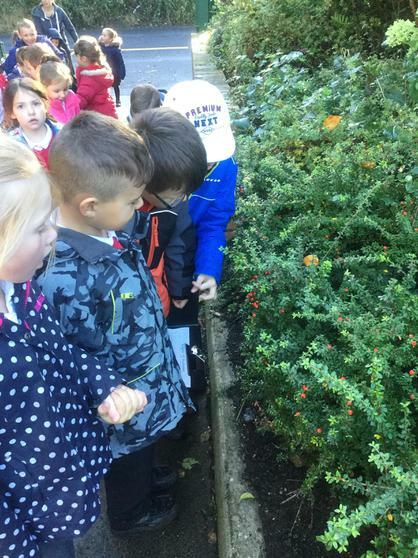 We learned that plants need sunlight, water and good quality soil to grow well. 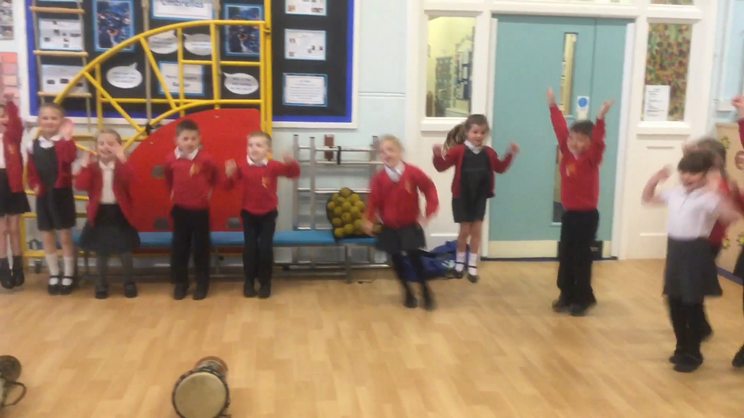 We sang 'The Sun Came Shining Down' as part of our Year 1 performance in our Harvest assembly. 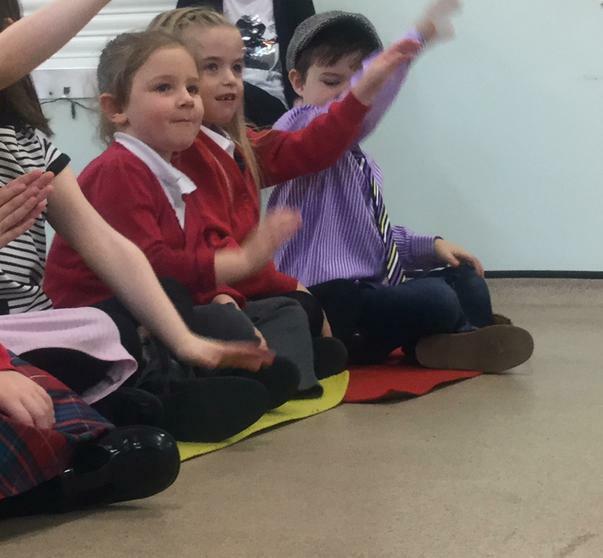 Here are some photos of our lovely celebrations. 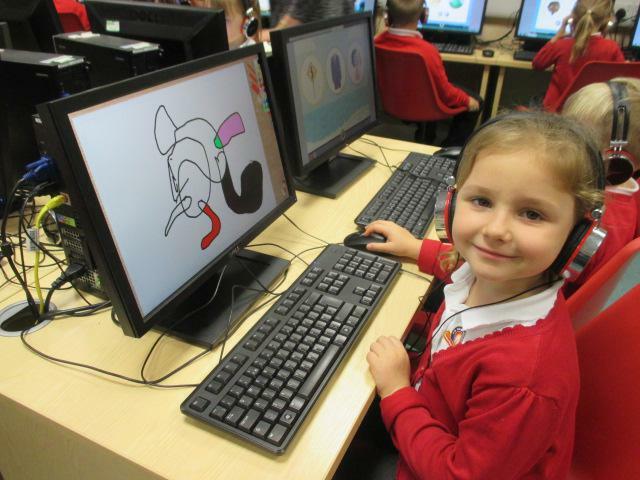 We are absolutely loving using the Lexia program in school and at home. 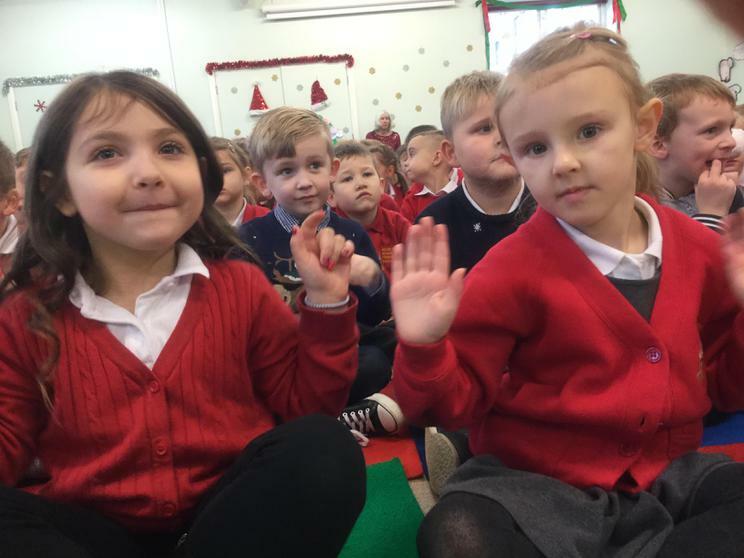 We look forward to our celebration assembly each Friday when the children who complete a level of Lexia receive a certificate for their hard work. 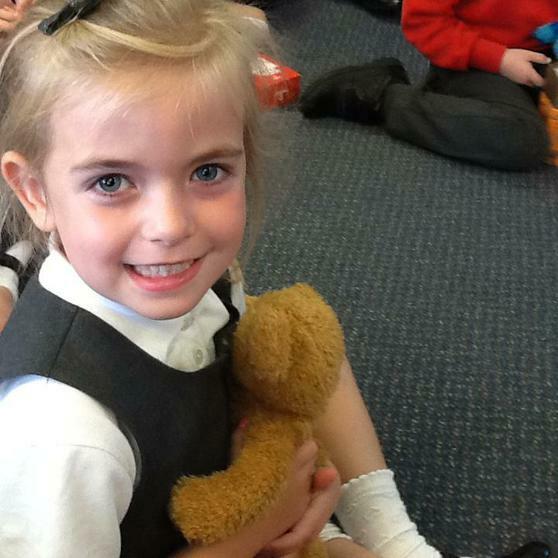 It makes us feel proud to see our classmates smile when they are awarded their certificate. 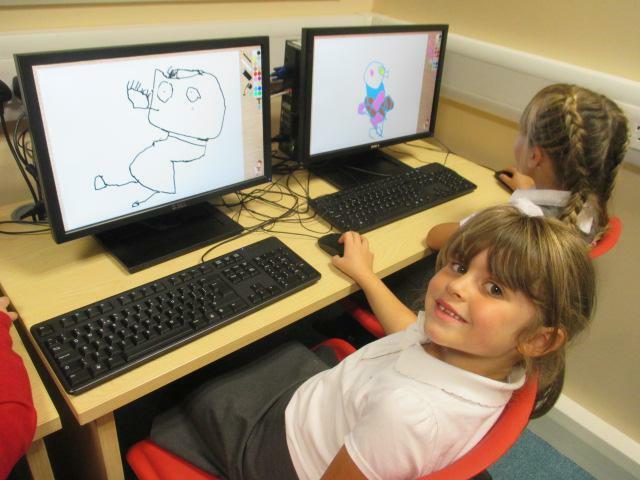 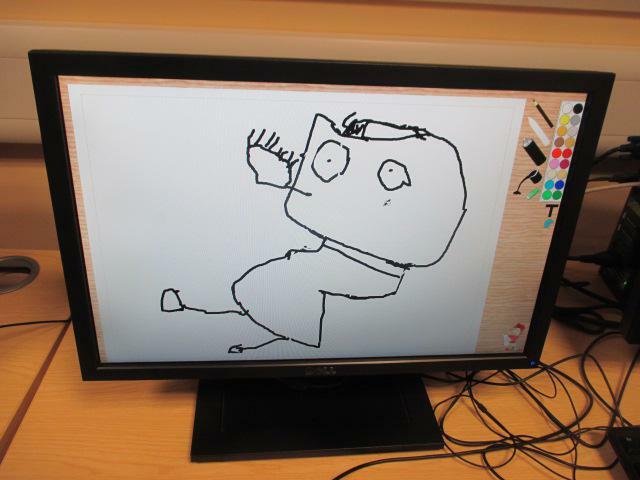 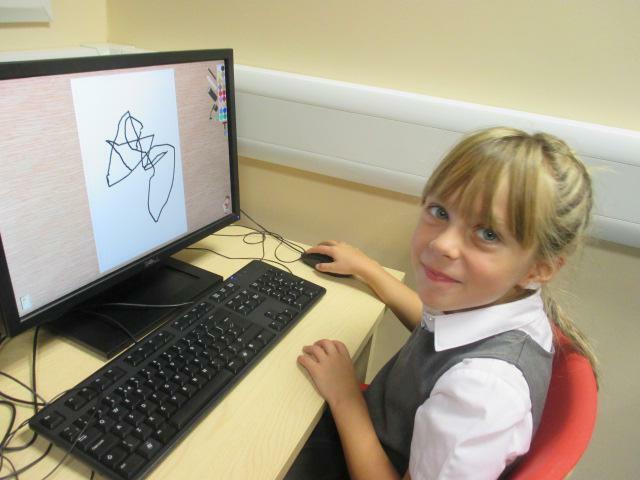 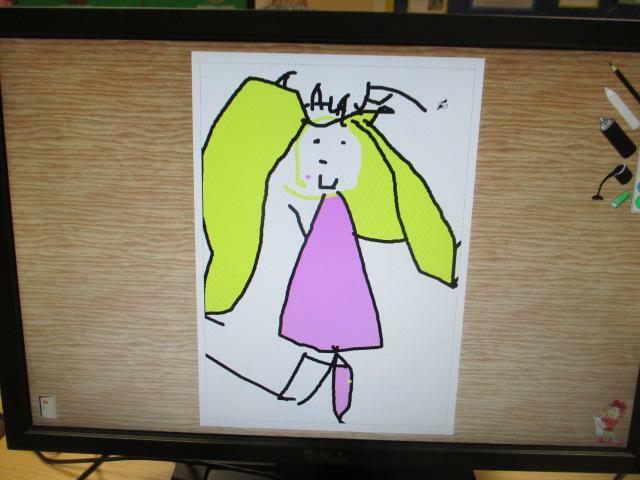 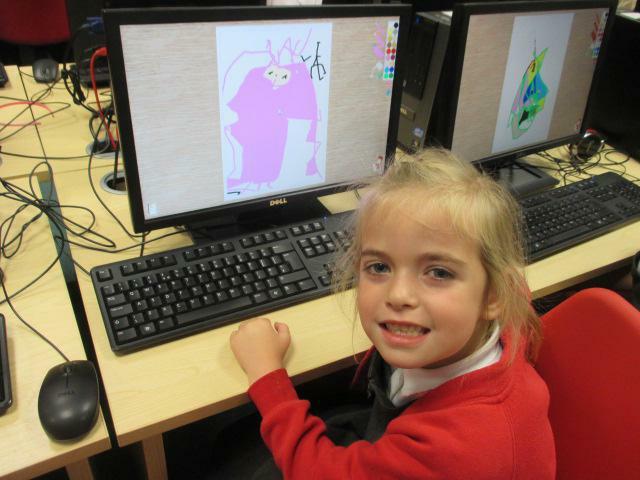 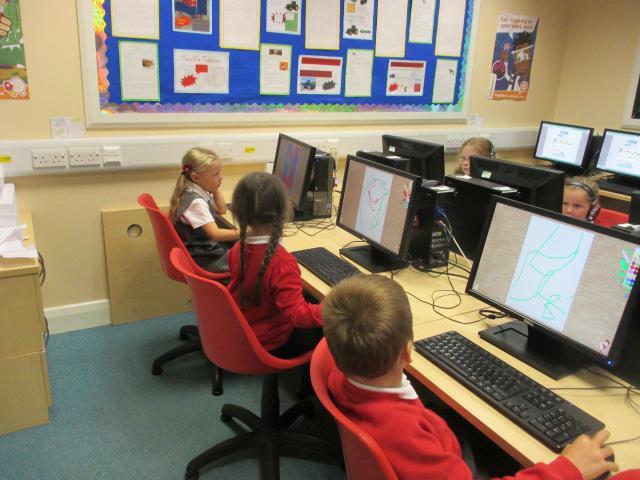 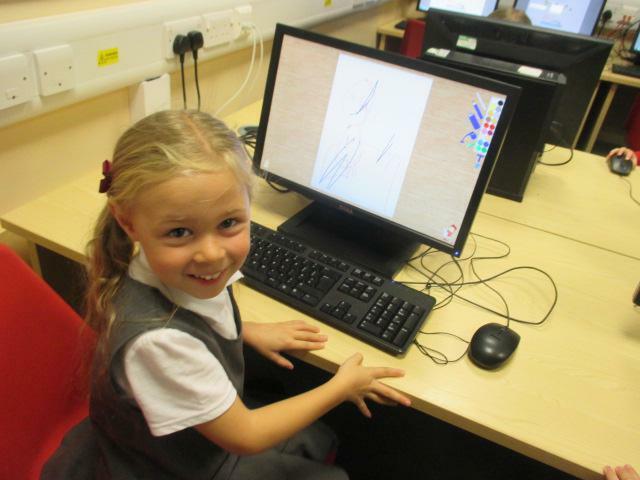 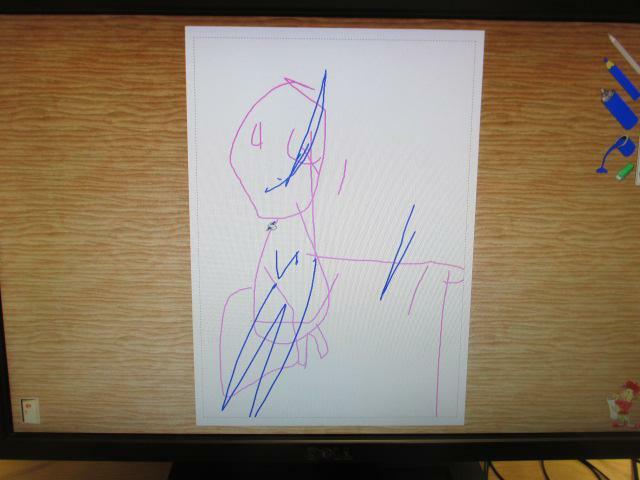 We really enjoyed using the 'Early Essentials' program in our computer suite. 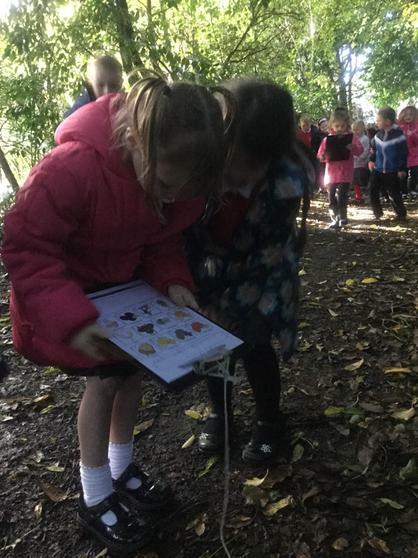 We thought it was great fun 'taking a line for a walk' which helped us to develop our hand-eye coordination and improve our mouse skills. 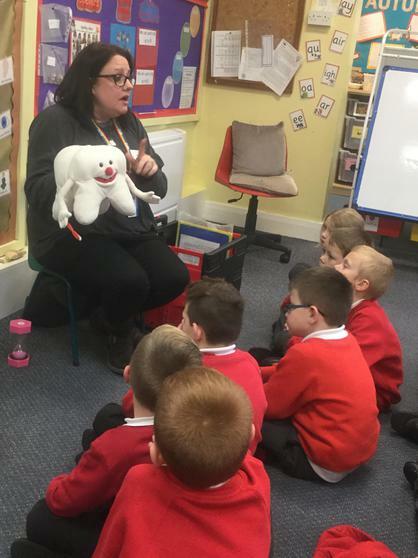 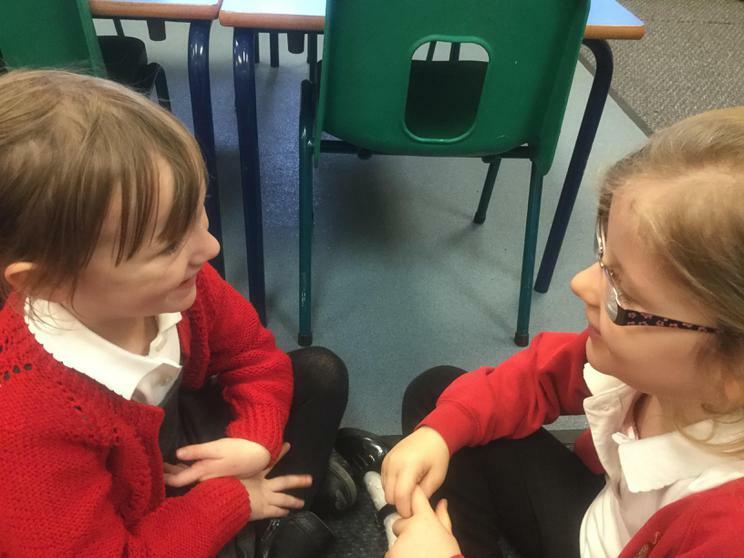 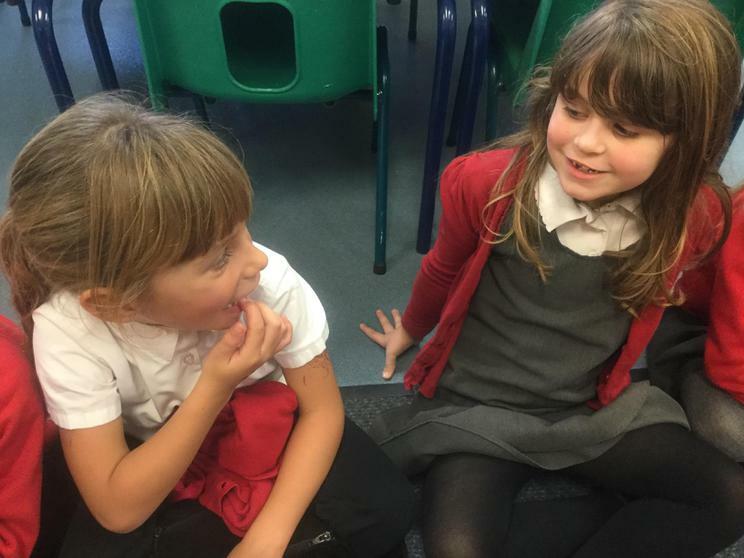 We had a lovely time talking to Alan Hall about the things which make us similar and the things which make us different as part of our P.S.H.E. 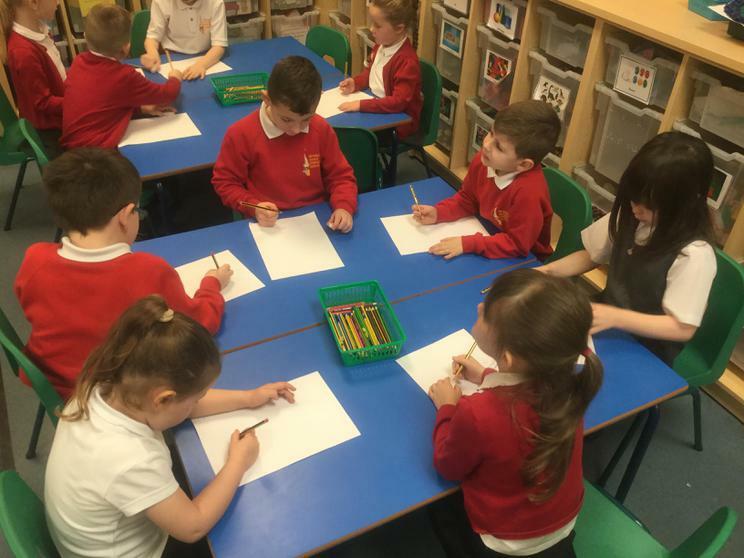 based learning. 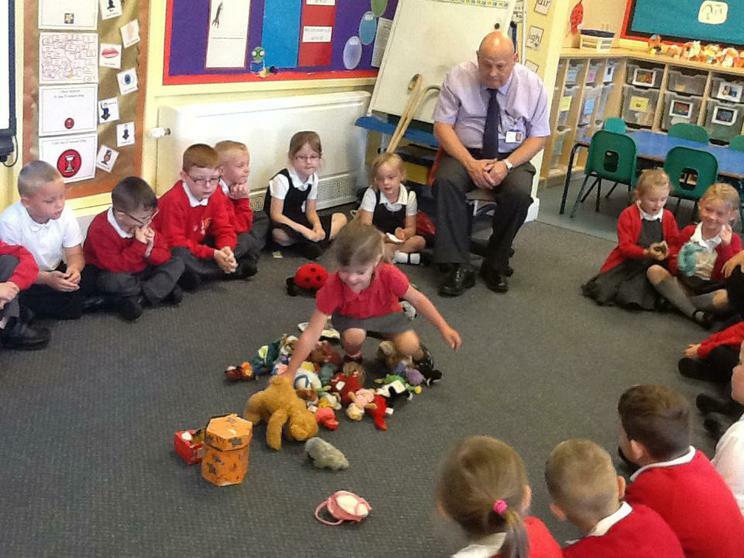 Alan introduced us to his favourite toys and we were given the opportunity to play with them. 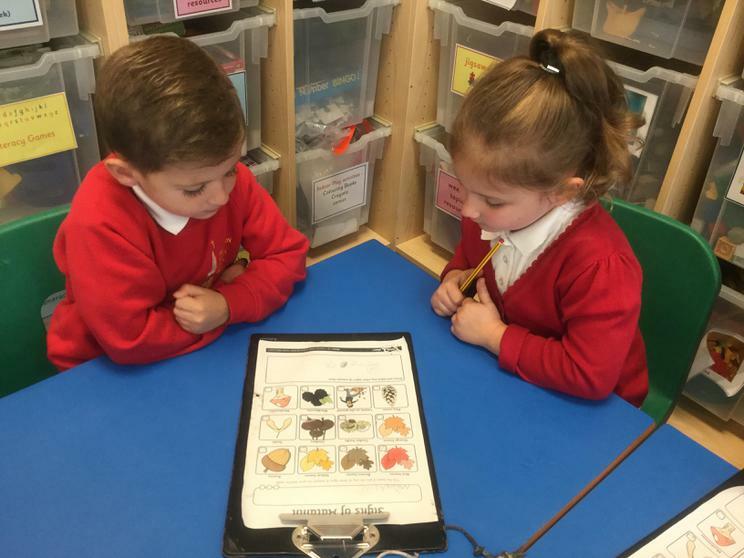 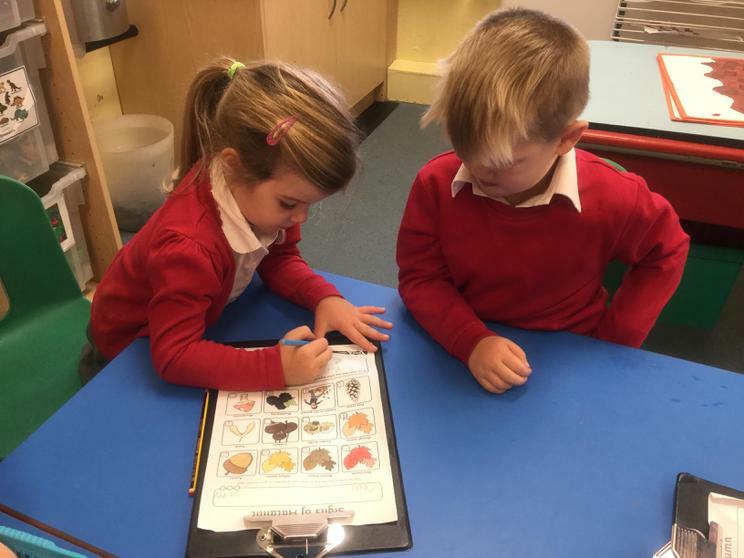 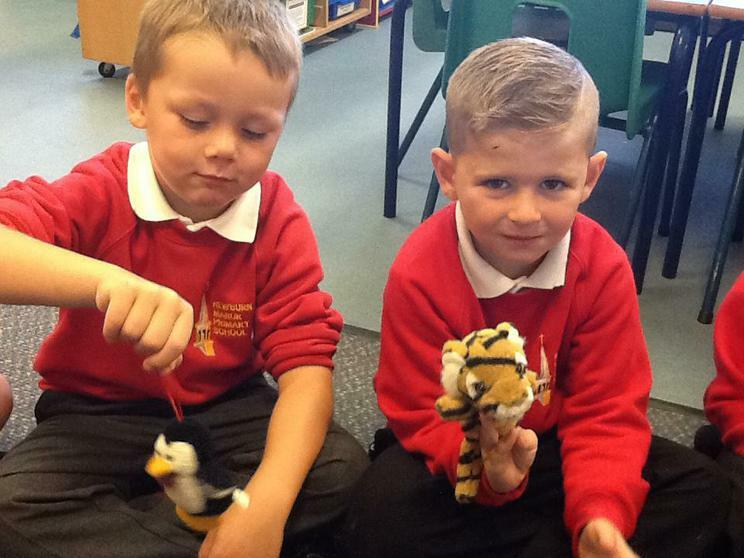 We chose a toy which appealed to us and we compared similarities and differences between the toys and the reasons for our choices. 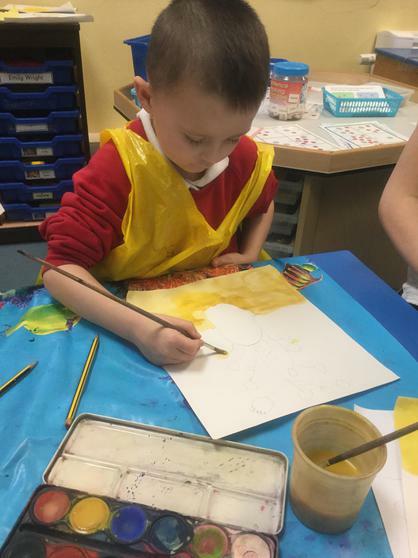 Alan was so impressed with our class, he said we were AMAZING! 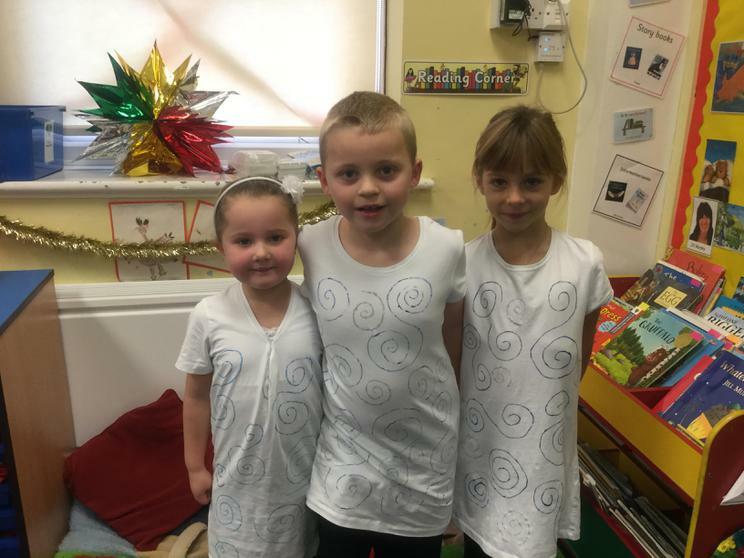 It's the start of the new year! 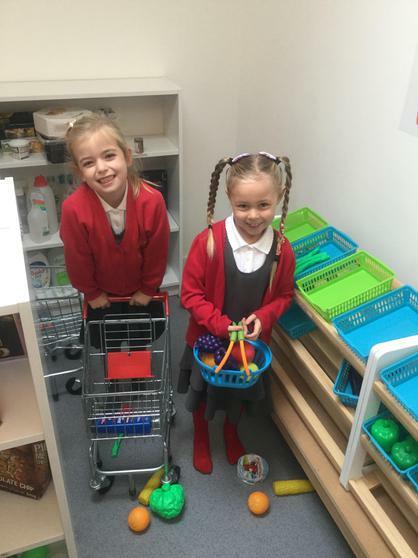 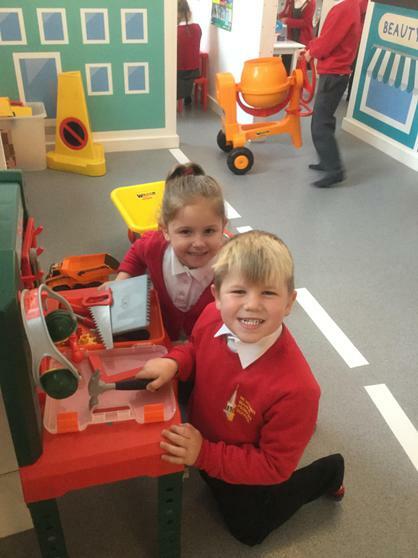 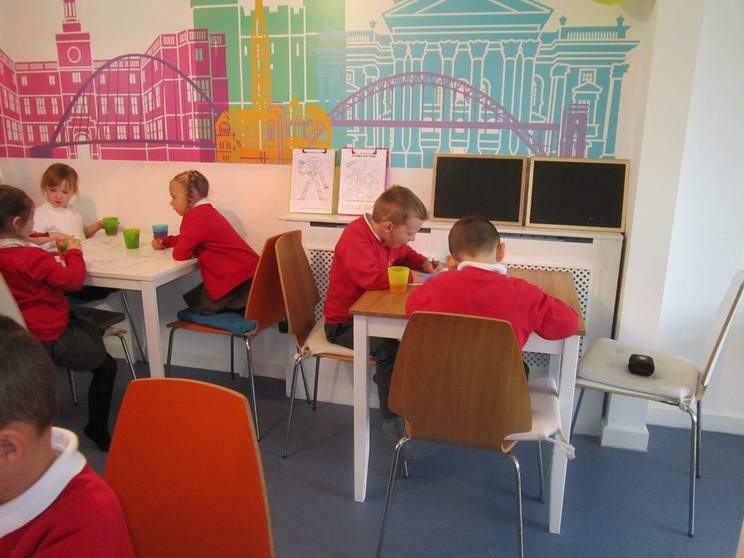 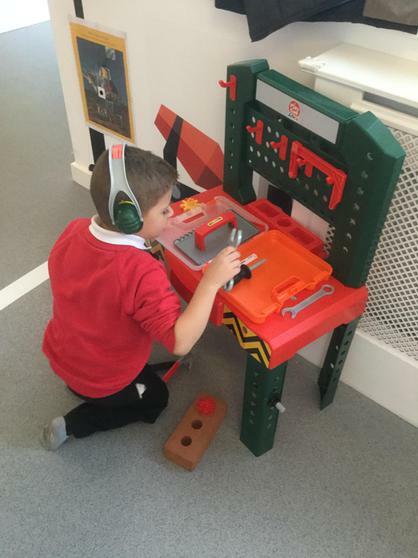 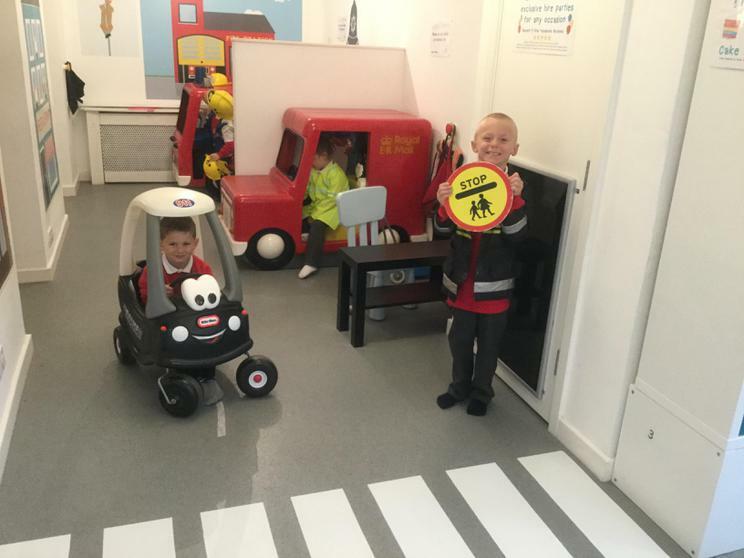 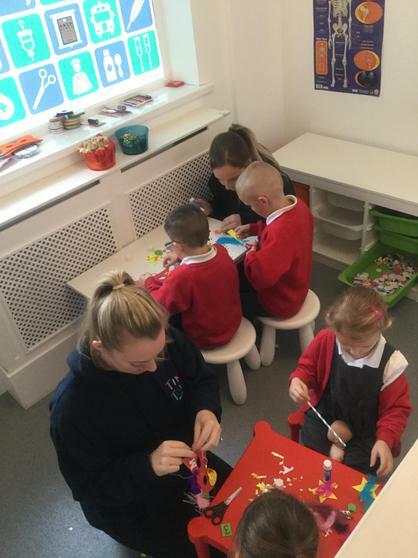 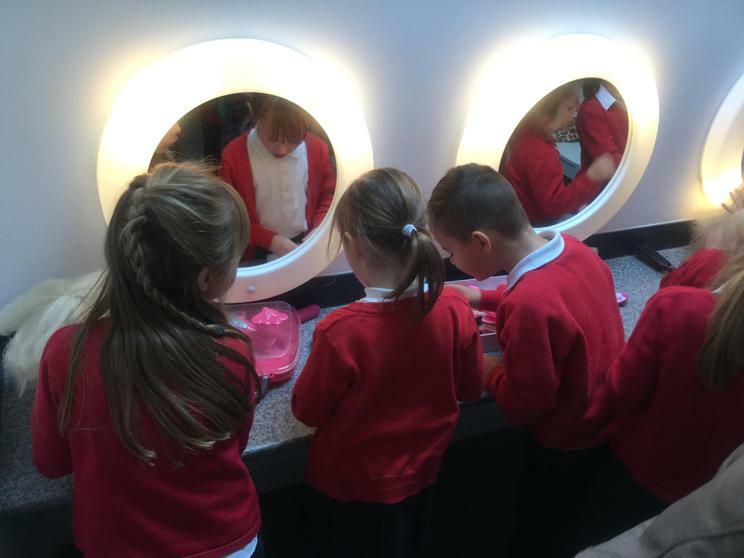 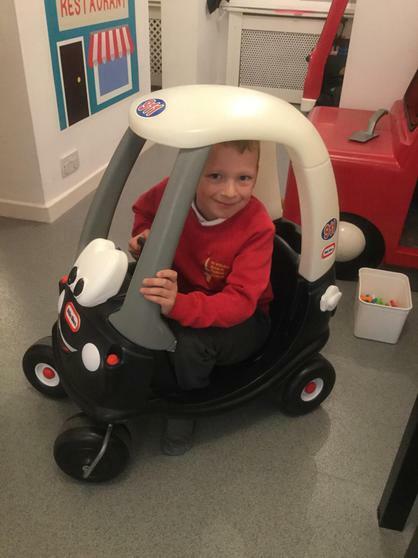 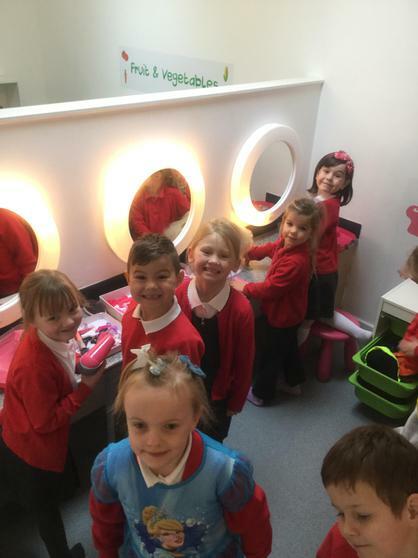 The children have had a lovely time in their new classroom. 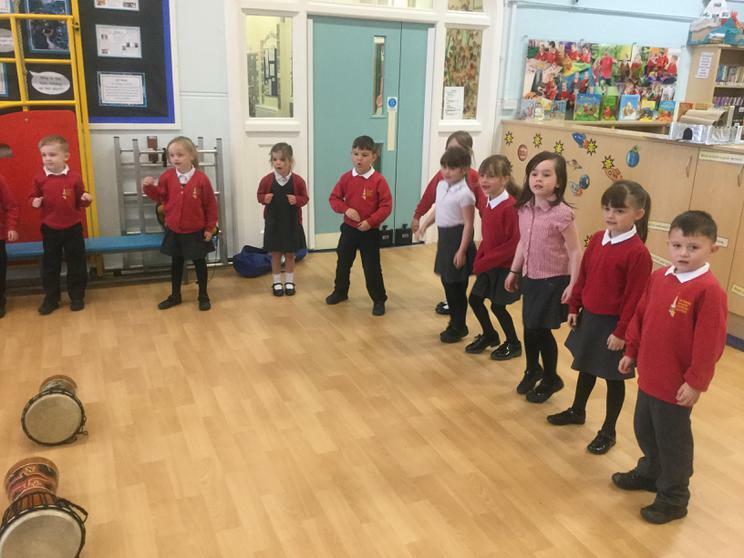 They are learning new routines and finding their way around with ease. 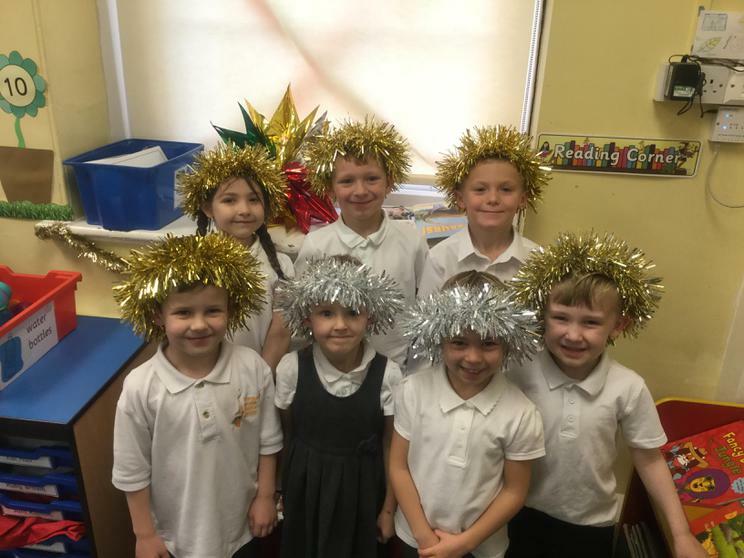 We are really looking forward to the new year ahead with your fantastic children! 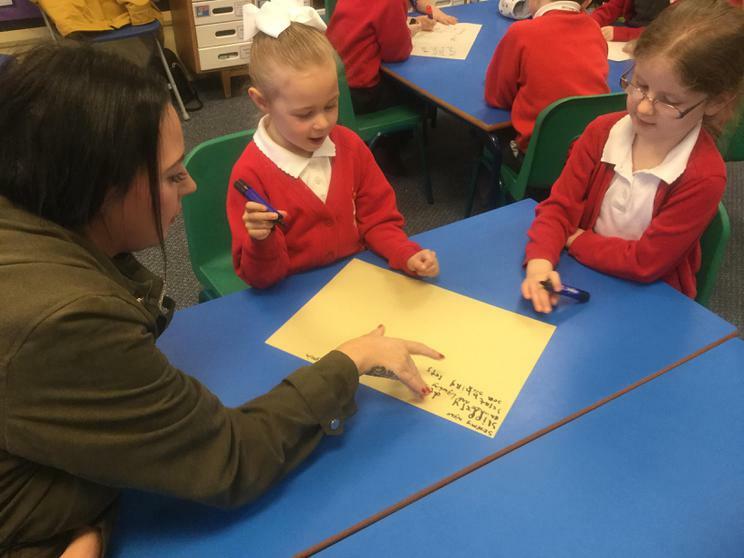 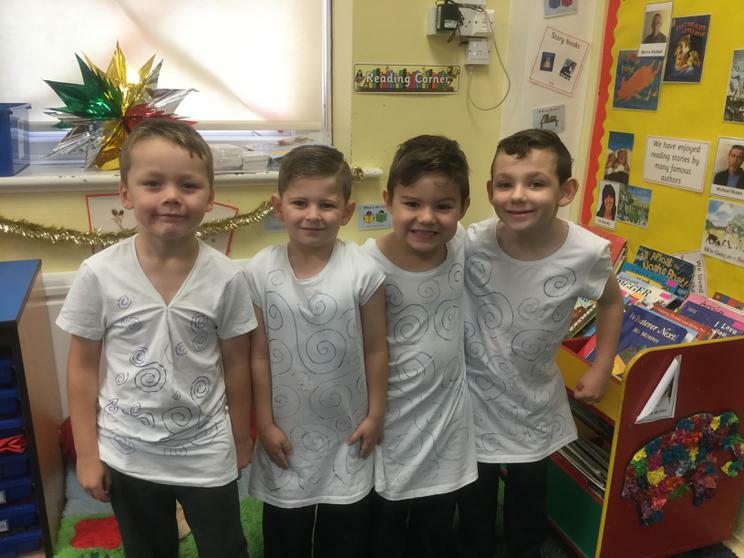 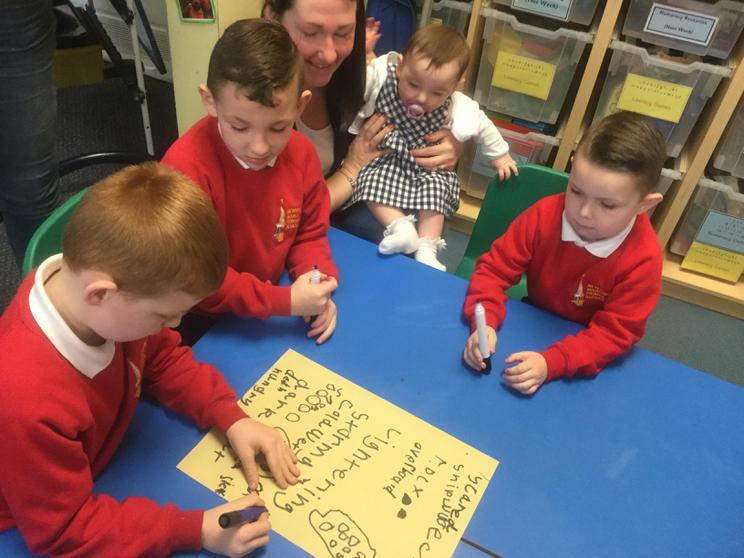 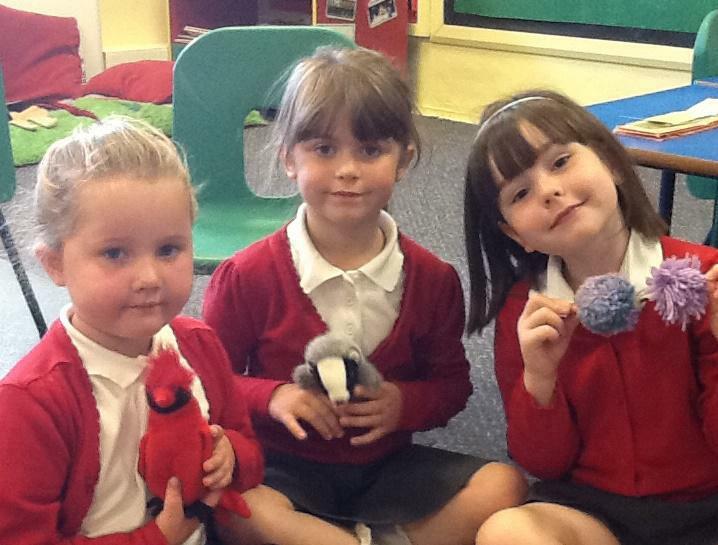 We can't wait to see them grow and develop their skills throughout Year 1.